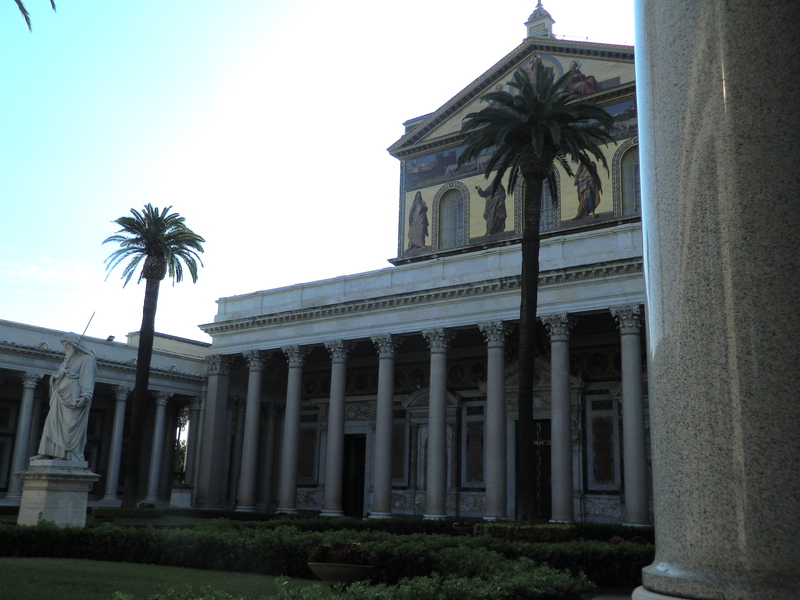 When you go to Rome on a spiritual journey of some sort, a must-do thing to formally complete the pilgrimage is to visit The Four Basilicas throughout the ancient city. 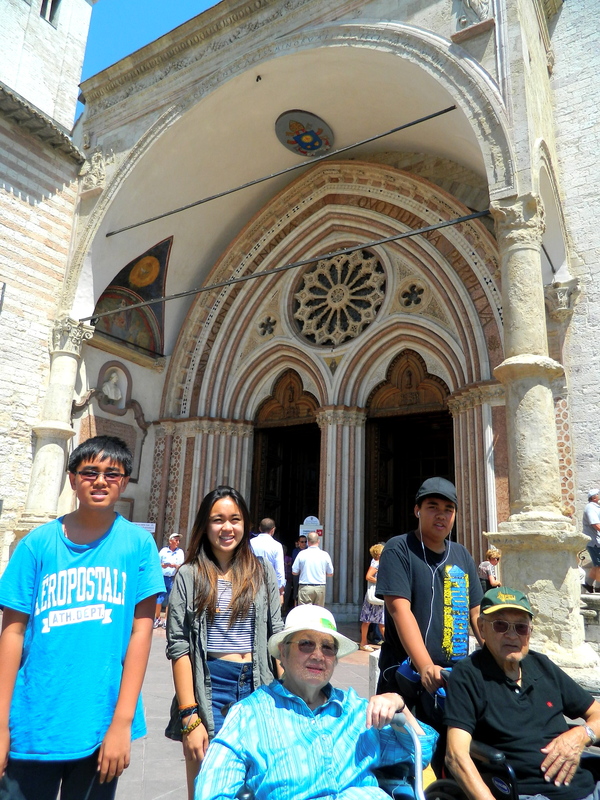 To visit some of the oldest basilicas in the world, built centuries ago by important figures in the Catholic Church and leaders of the Roman Empire, and to see and pray to the holy relics inside is a vital part of the pilgrimage experience. 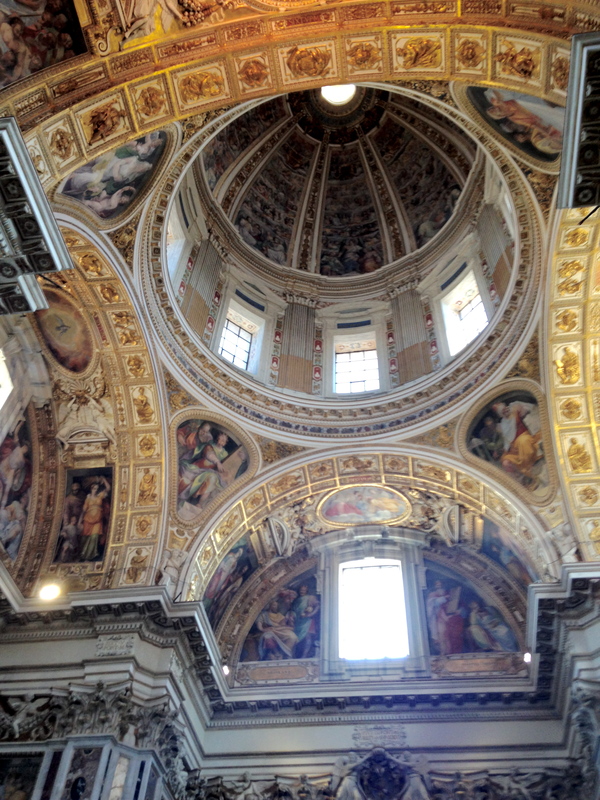 Each church is different, from the Italian Renaissance architecture to every piece of important artwork inside, and all of the restorations made since then. 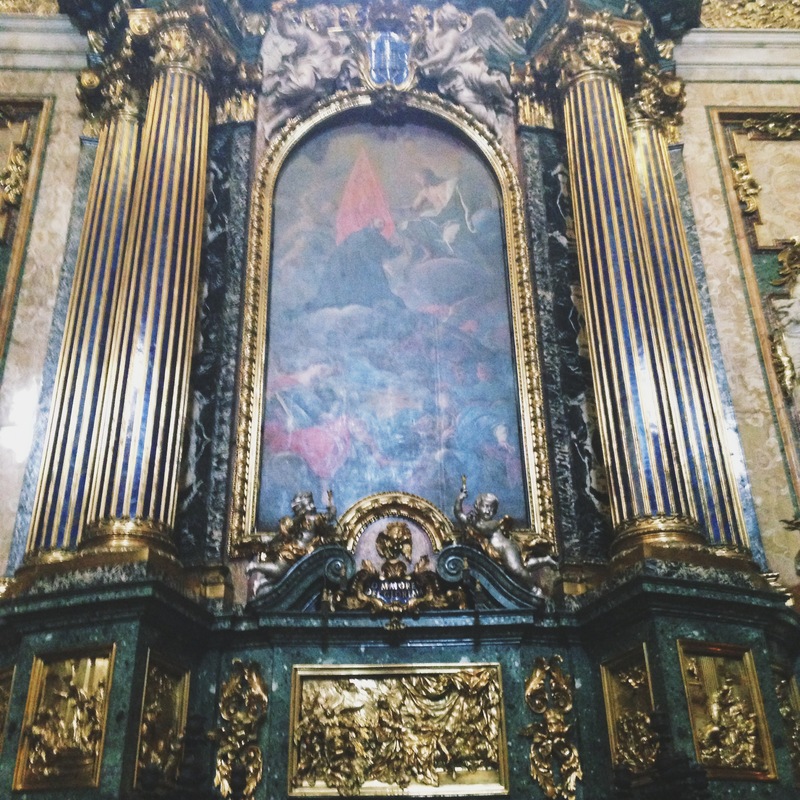 Walking into some of the churches I felt like I had stepped into a dreamlike world, a holy place where thousands of people have stepped in to pray, worship, and admire. 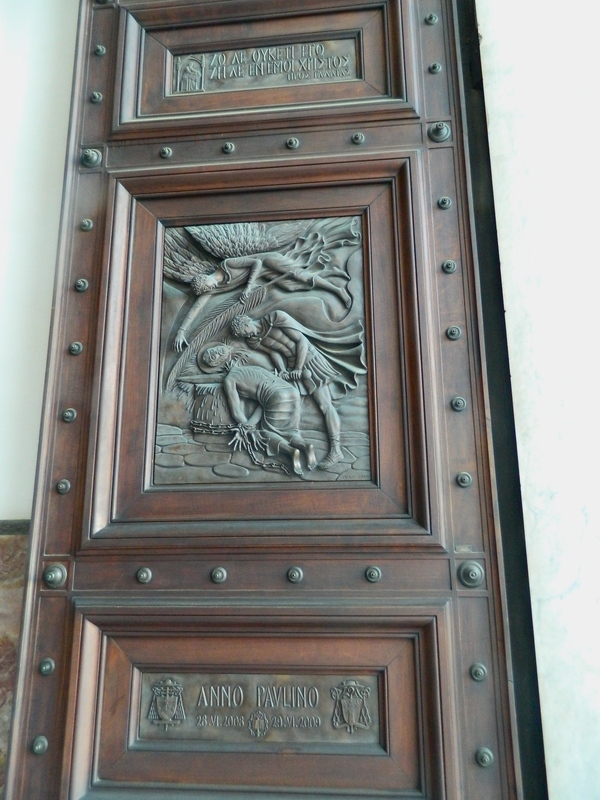 I was taken back by the amount of detail put into every corner, door handle, and ceiling. 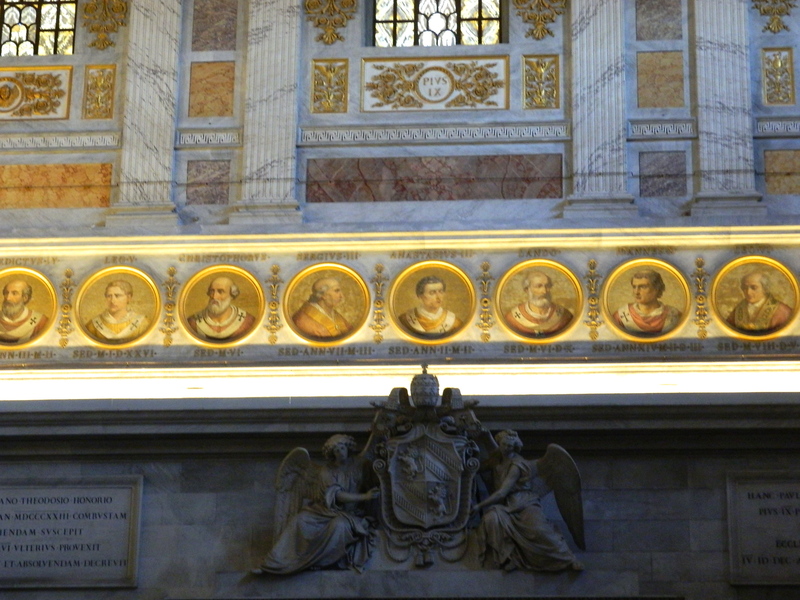 I couldn’t believe the age of some of these places, as well as just thinking about who has been within its ancient walls: popes, emperors, future saints and world leaders. 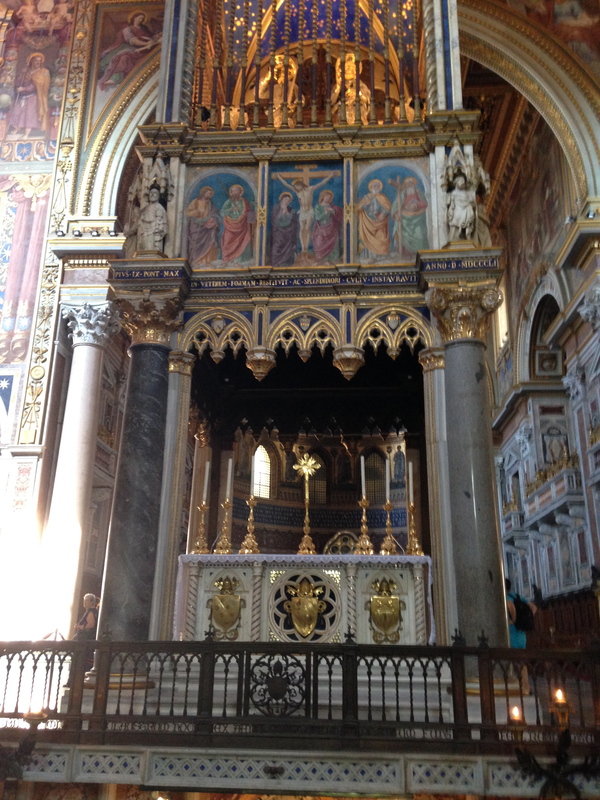 Of course, with the respect and high importance of these churches they are a must-see. 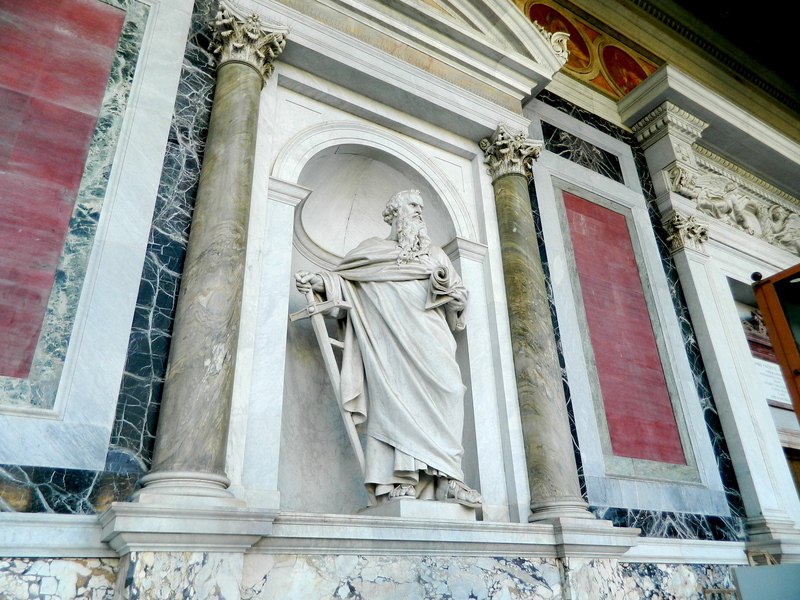 The four major basilicas in Rome include St. Peter’s Basilica in Vatican City, which remains the largest church in the world, St. Paul’s Basilica (also called St. Paul’s Outside the Walls), the Archbasilica of St. John Lateran (San Giovanni), and the Basilica of Saint Maria Maggiore. 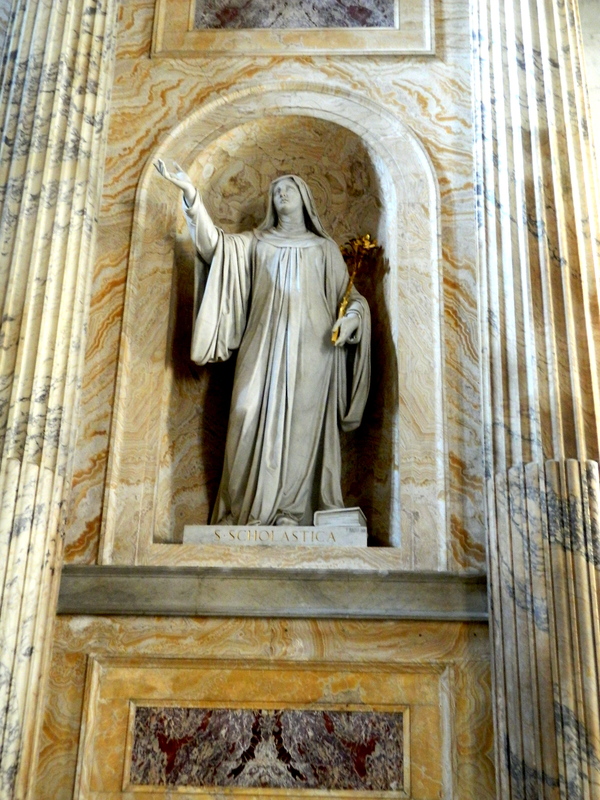 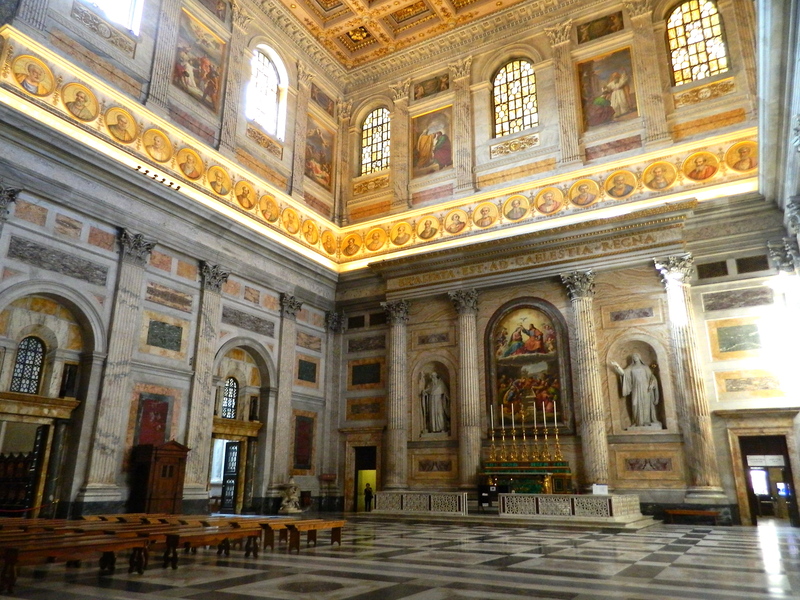 Each of the basilicas have their own importance to the Catholic tradition, and in 1300 Pope Boniface VIII renewed certain “great remissions and indulgences for sins” which are to be obtained “by visiting the city of Rome and the venerable basilica of the Prince of the Apostles”. 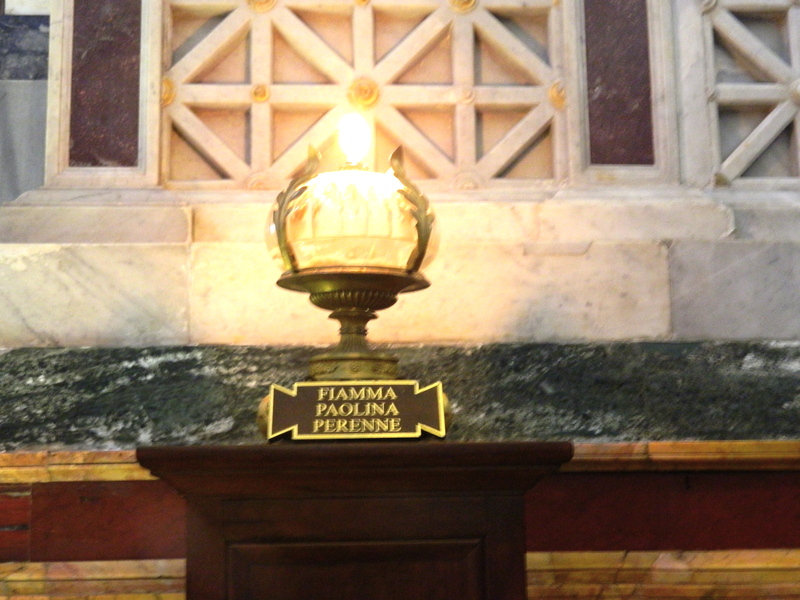 (source) That’s why thousands of pilgrims visit Rome every year, to witness these ancient holy sites and pray for their intentions. 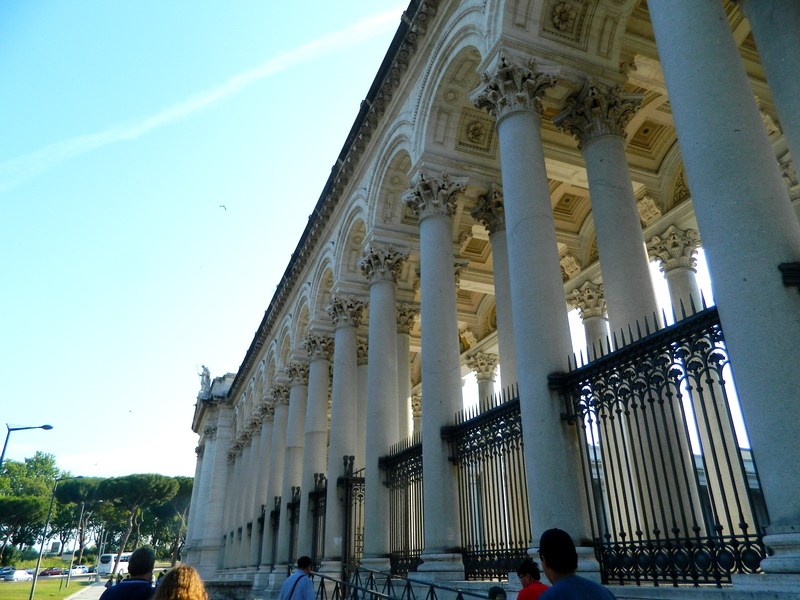 When we arrived back in Rome after a few days in the Florence countryside, it was almost a culture shock to see so many tall buildings and ancient ruins, wider boulevards, hundreds of little cars lining the streets. 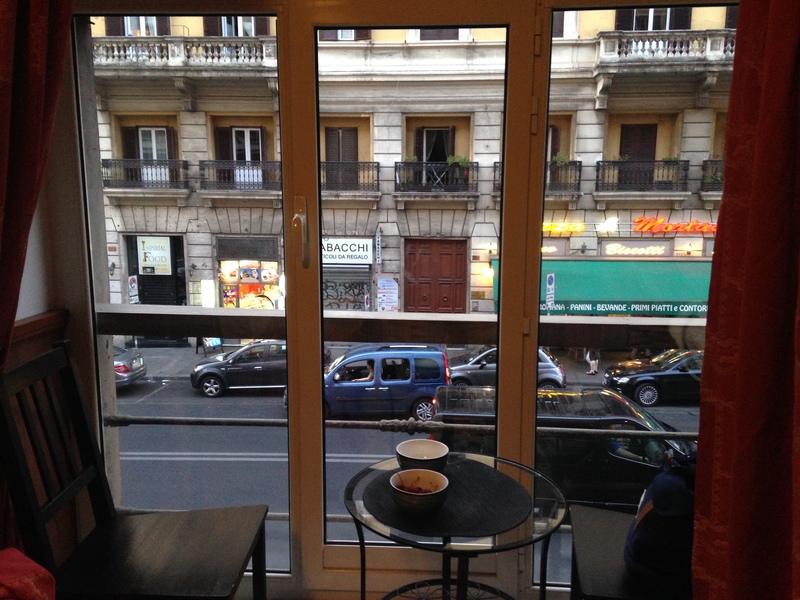 We stayed in a small but comfortable little hostel this time, right in the middle of the city. 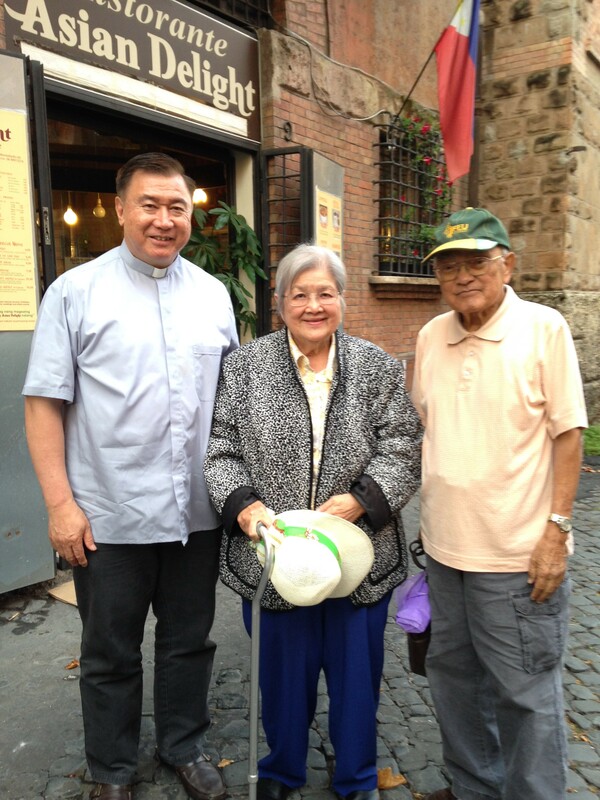 On Thursday our driver, Danilo, picked us up in our little van with Fr. 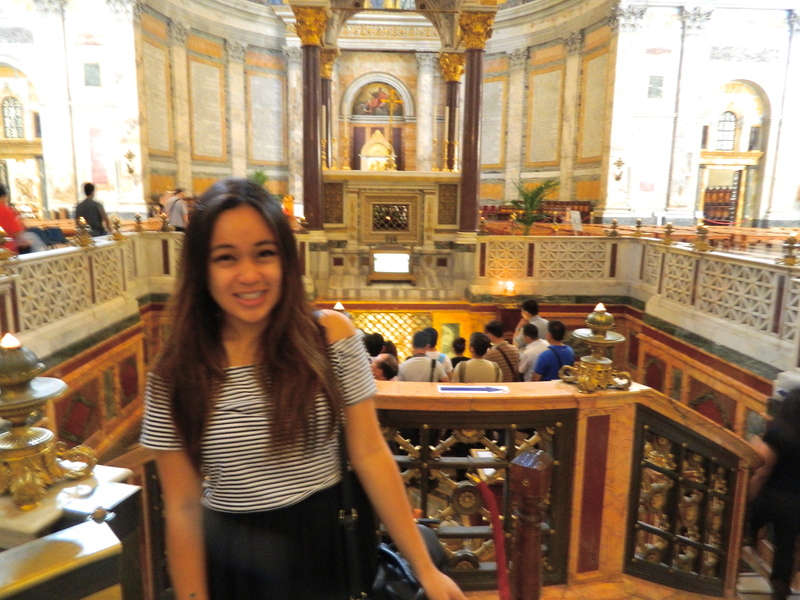 Memeng Salonga from the Colegio Pilipino (Filipino College) of Rome, who was to be our guide that day and show us around all of the different basilicas. 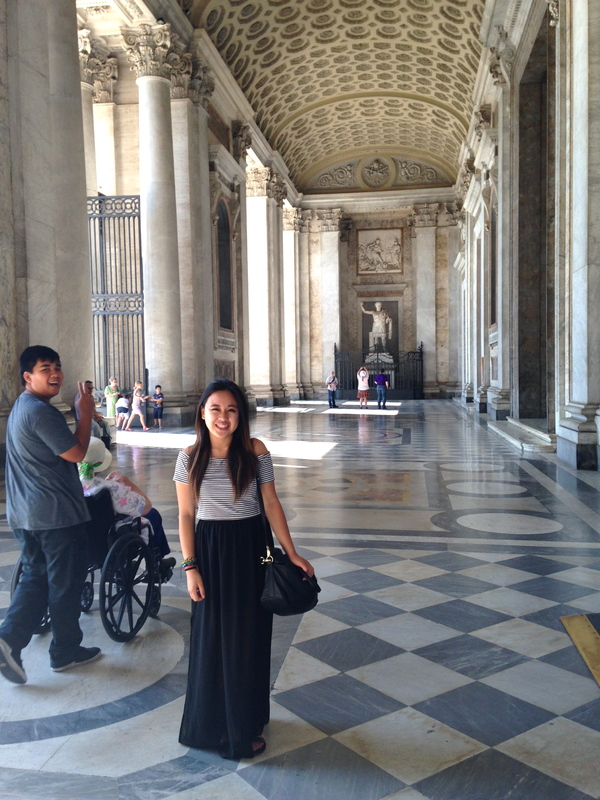 Since we visited St. Peter’s Basilica in Vatican City on our first day, we just visited the other three major ones. 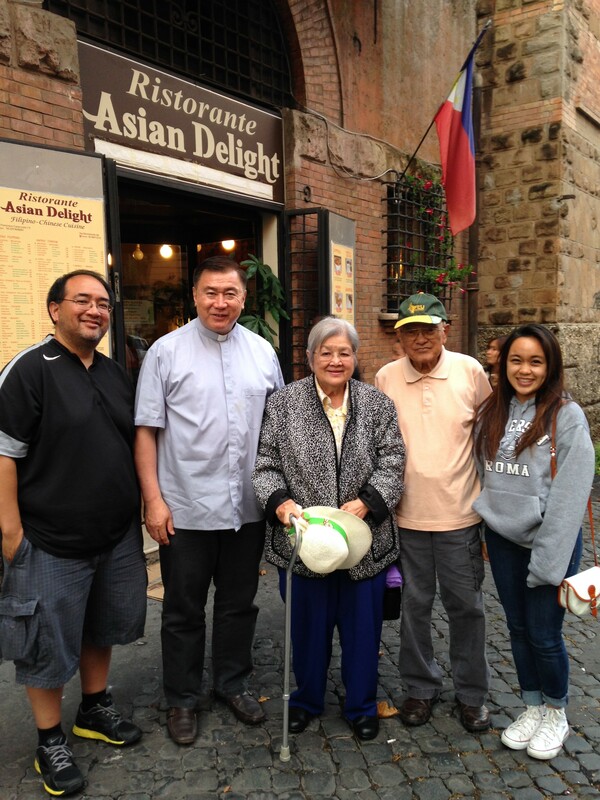 Father Memeng is a Filipino priest working at the Filipino College whose family is spread out all over, and whose sister lives back at home in Los Angeles and knows my Lolo Pete and his family. 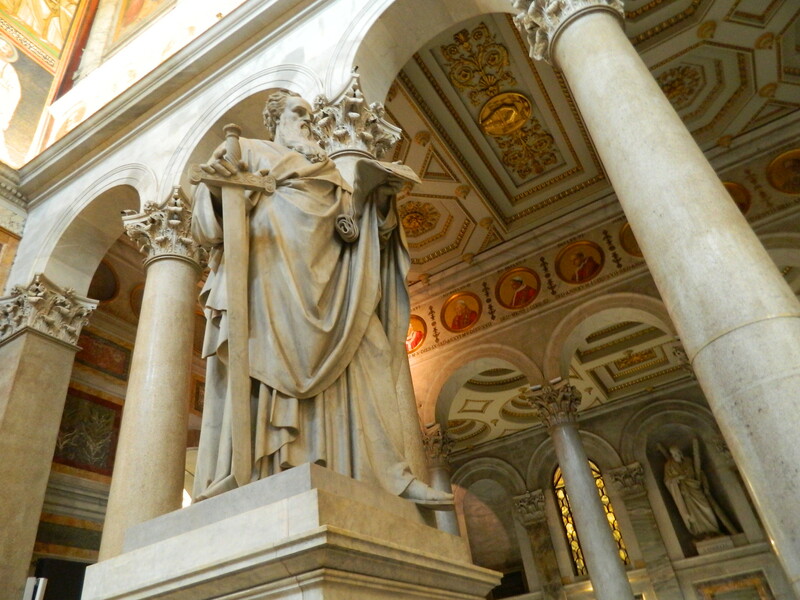 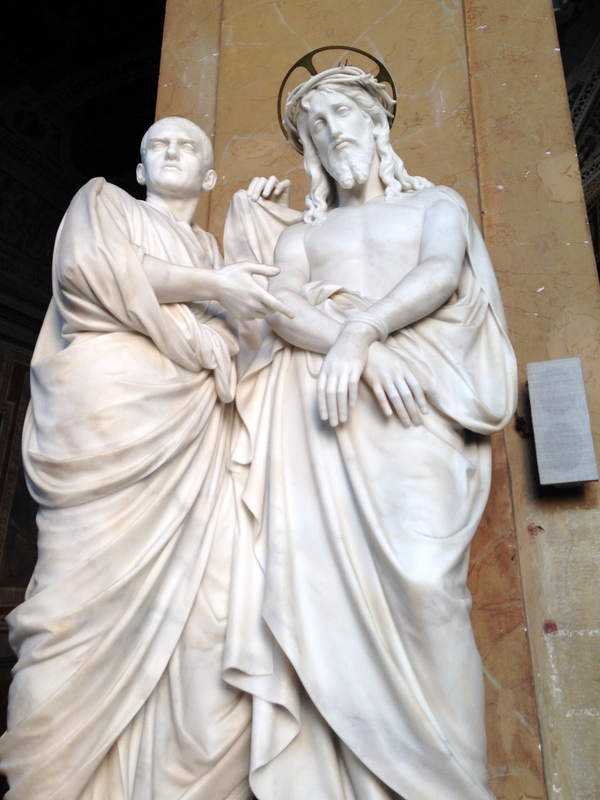 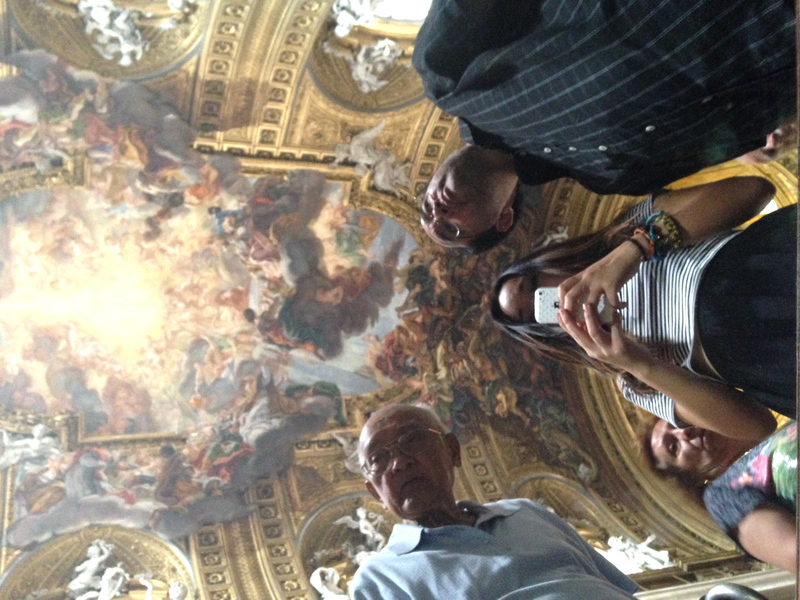 He was more than happy to show us around that day, and to pray with us at each of the basilicas. 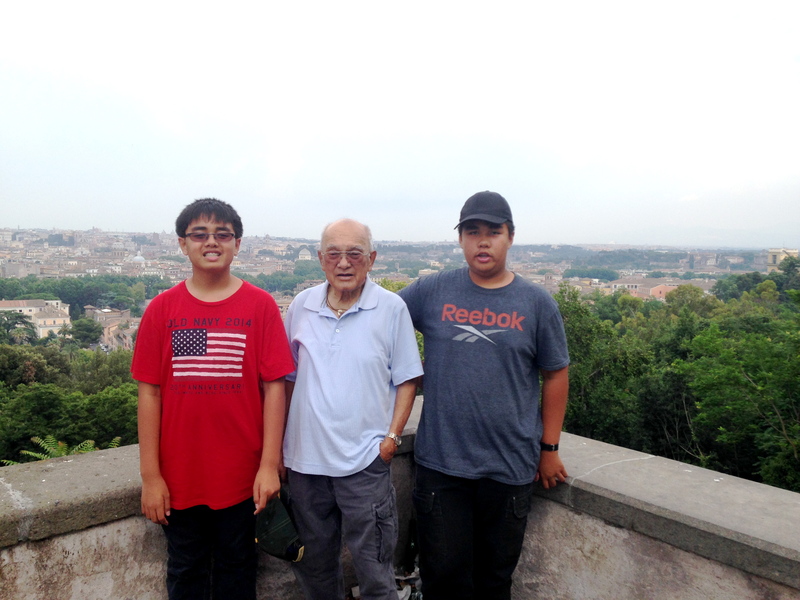 It was great getting to know him and asking him many questions about the different sites, as well as the history of each and every place we went to. 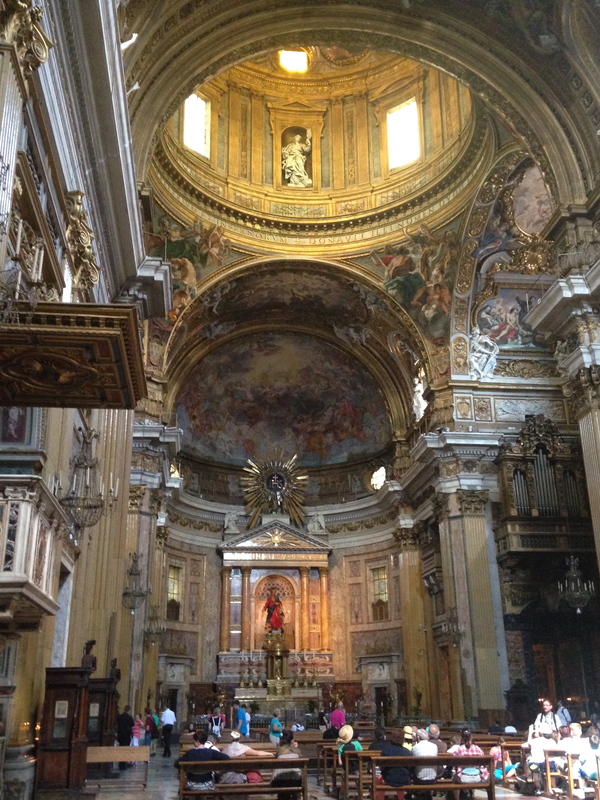 Rome has such a long history with the Catholic faith and so many churches/religious sites to see; by the end of it all we were exhausted and all Renaissance-d out but ultimately feeling blessed. 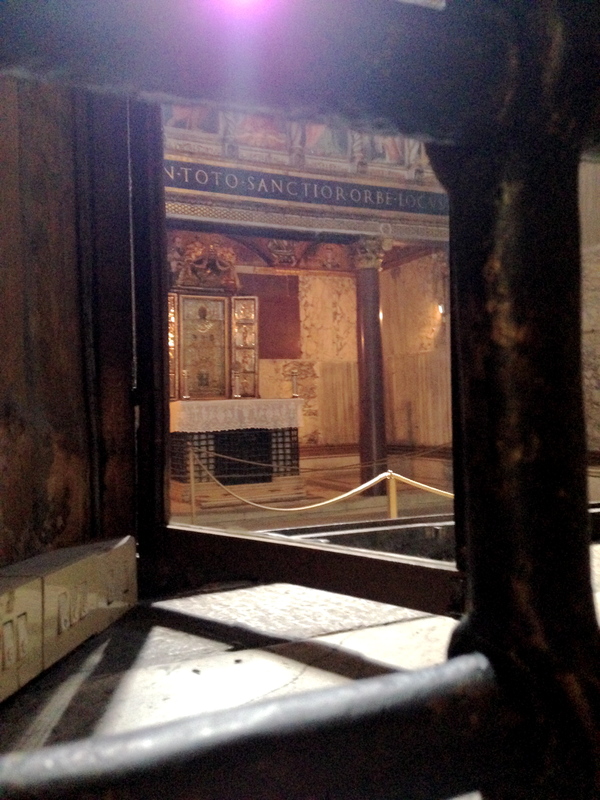 View from our new (and final!) 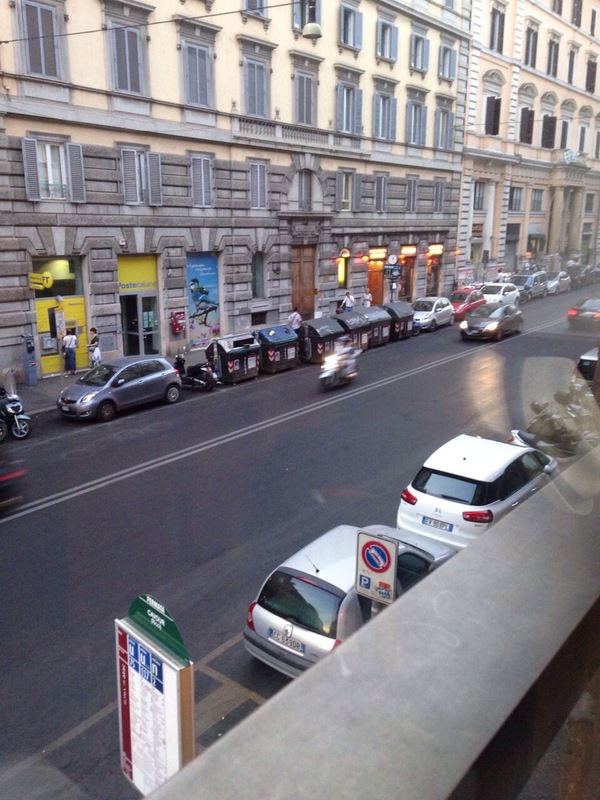 lodging in Rome, the Nakissa Inn! 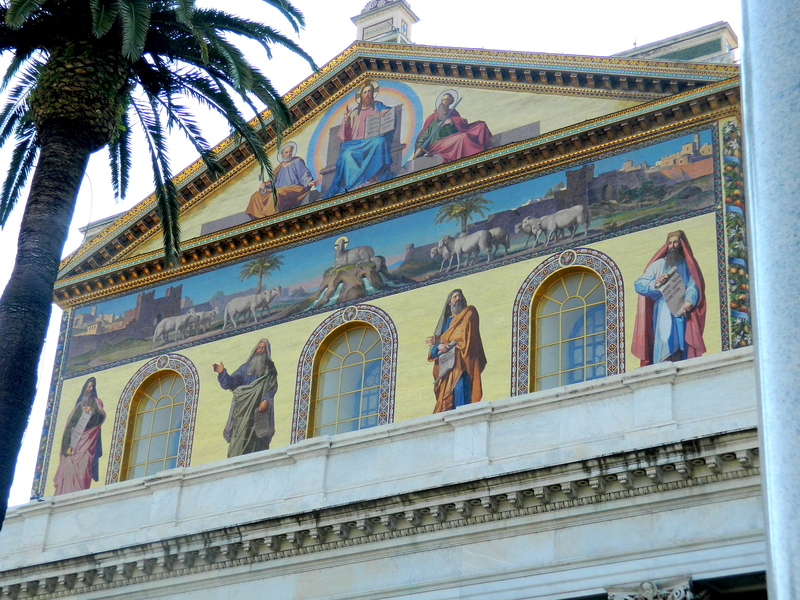 Exterior of St. Paul’s Basilica. 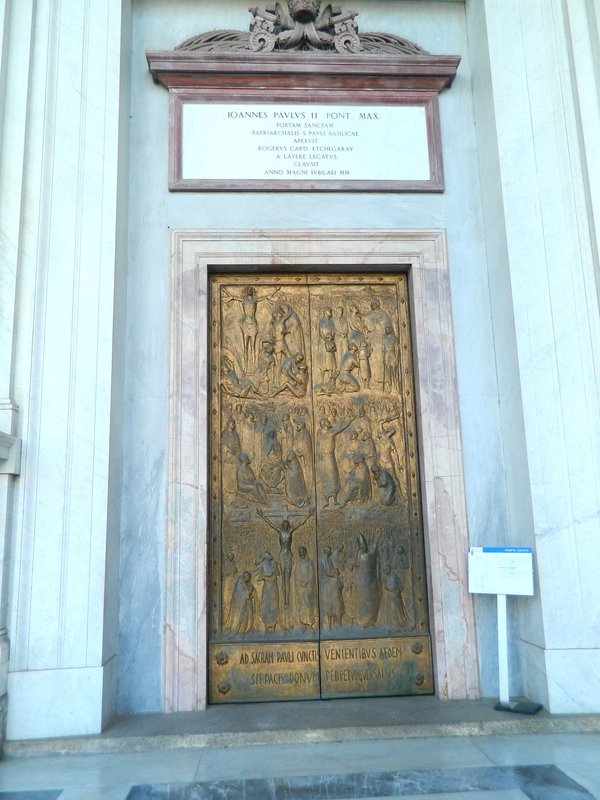 Artwork of the door commemorating the life of holy Saint Paul. 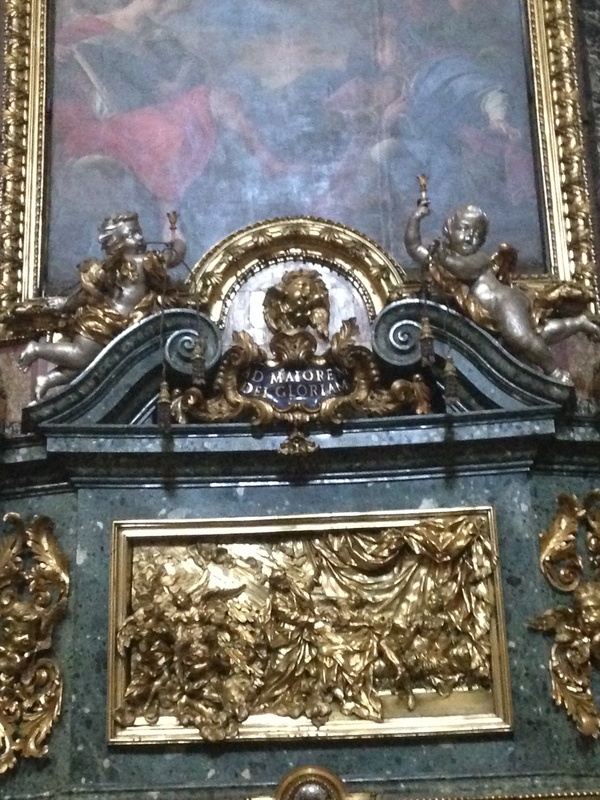 In this scene, Paul is being beheaded and brought into heaven by the angels. 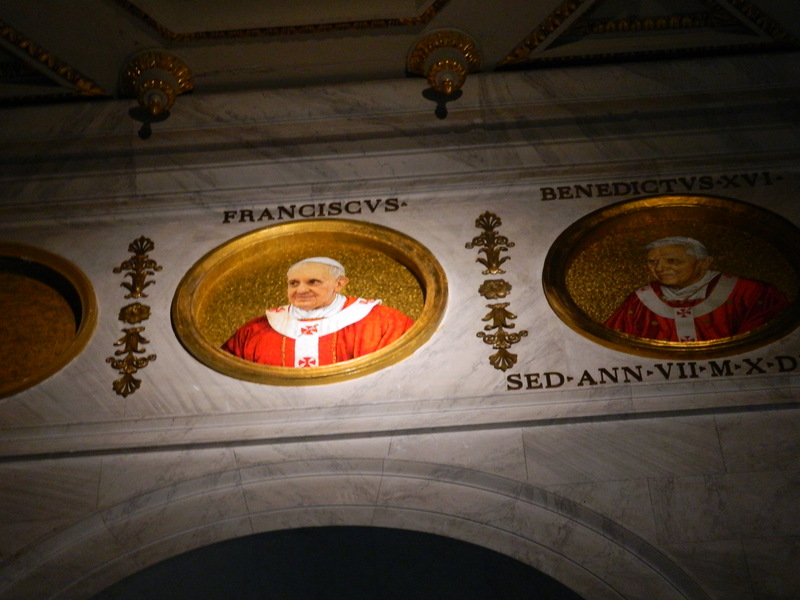 The walls adorned with mosaics of every single Pope! 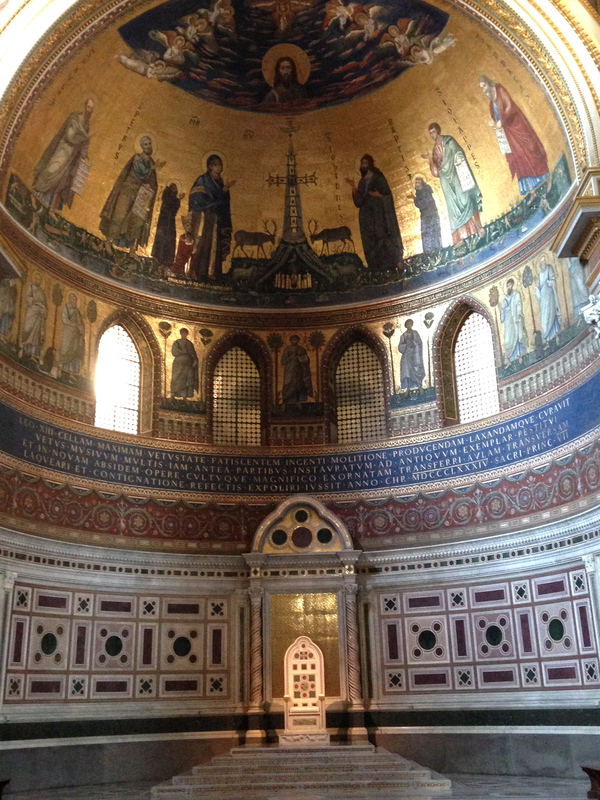 The Apse with the triumphal arch. 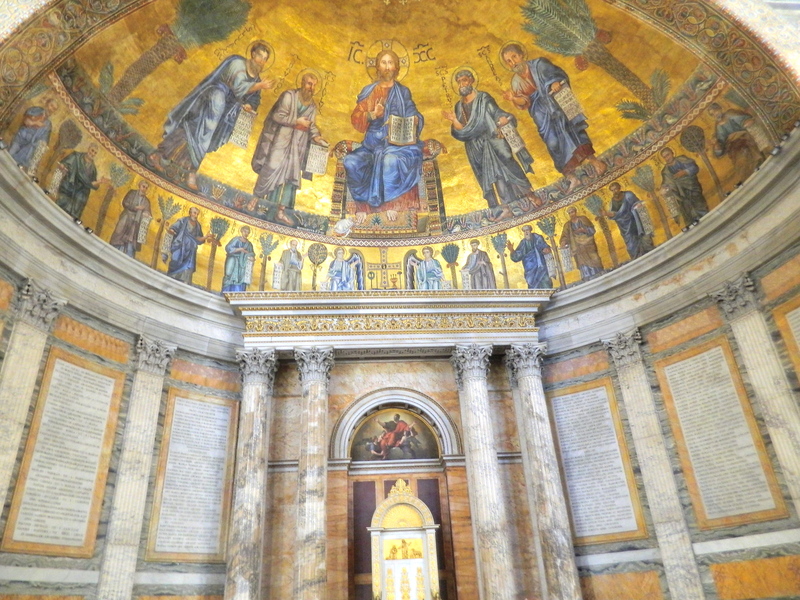 Mosaic artwork restored from the work of Pietro Cavallini. 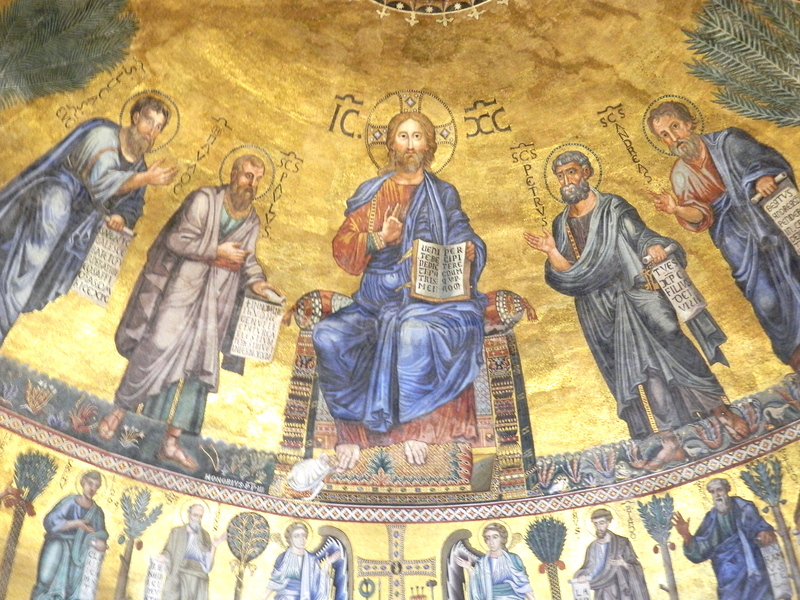 Mosaic artwork done by Pietro Cavallini, depicting Jesus Christ and the apostles Peter, Paul, Andrew and Luke. 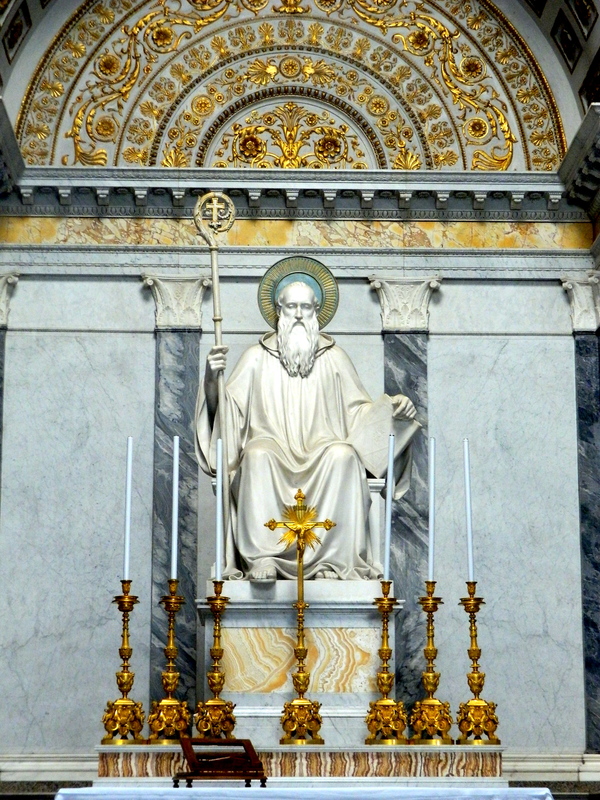 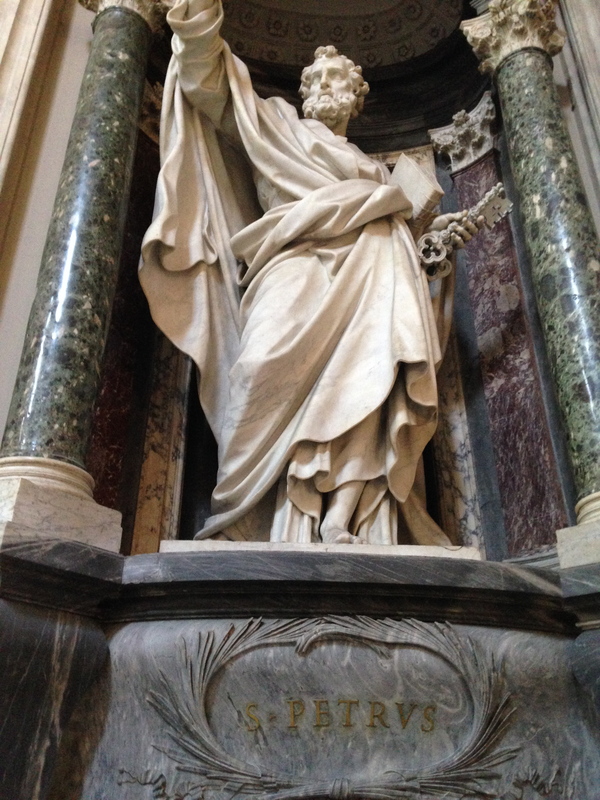 The Tomb of St. Paul. 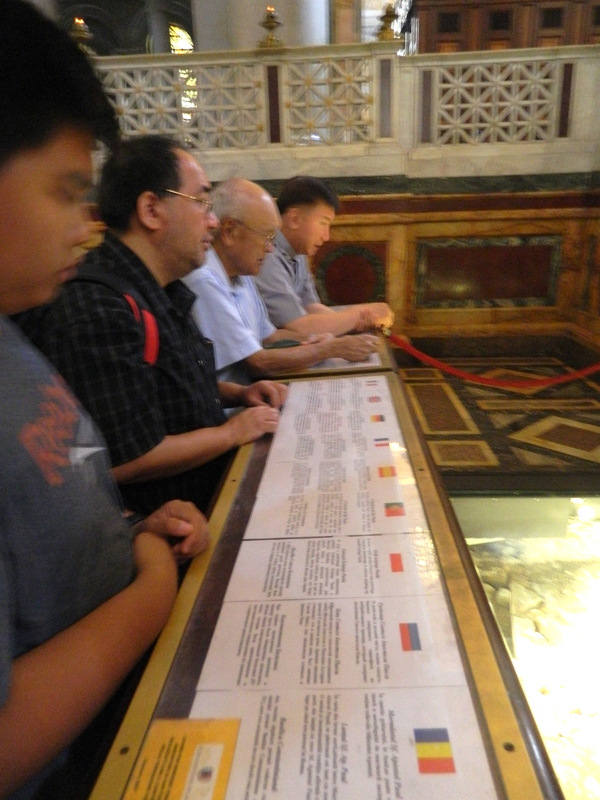 Uncle Paul at St. Paul’s tomb! 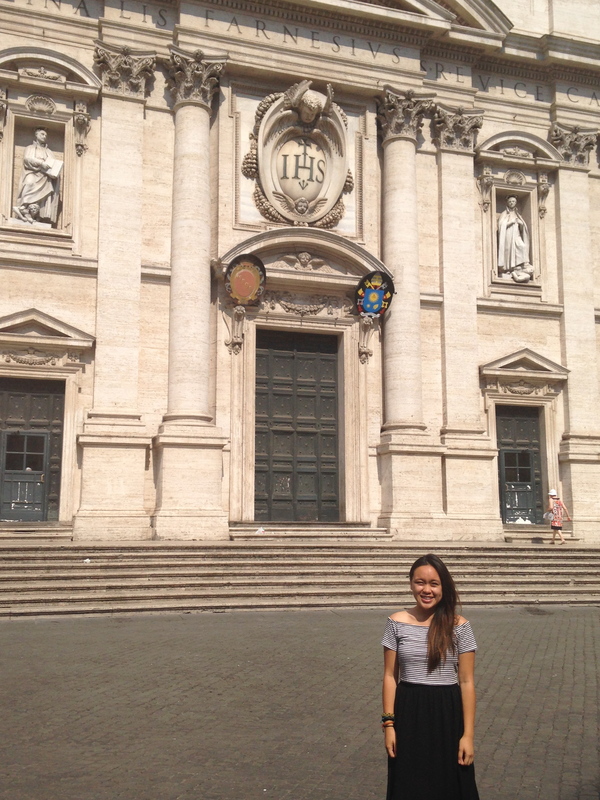 Yay Pope Francis! 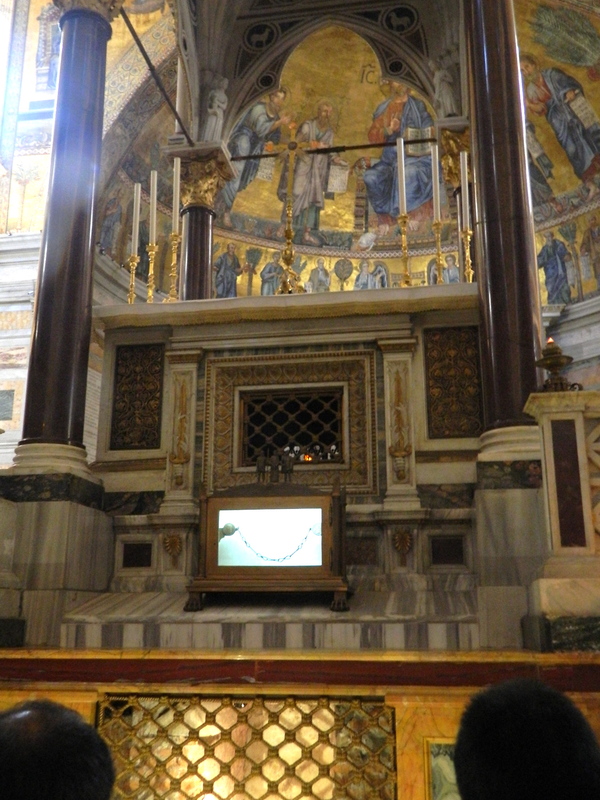 His mosaic is lit up, since he is the current Pope. 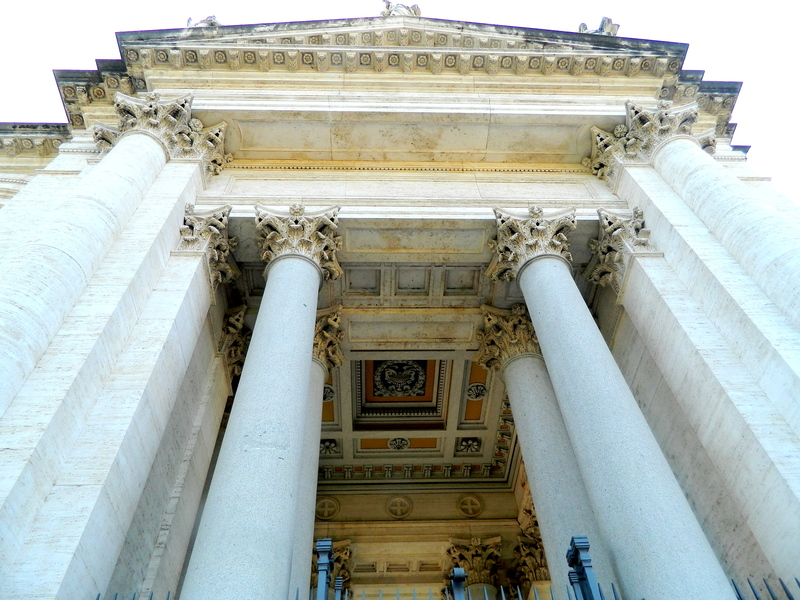 Exterior of the Basilica St. John Lateran (Basilica di San Giovanni Laterano). 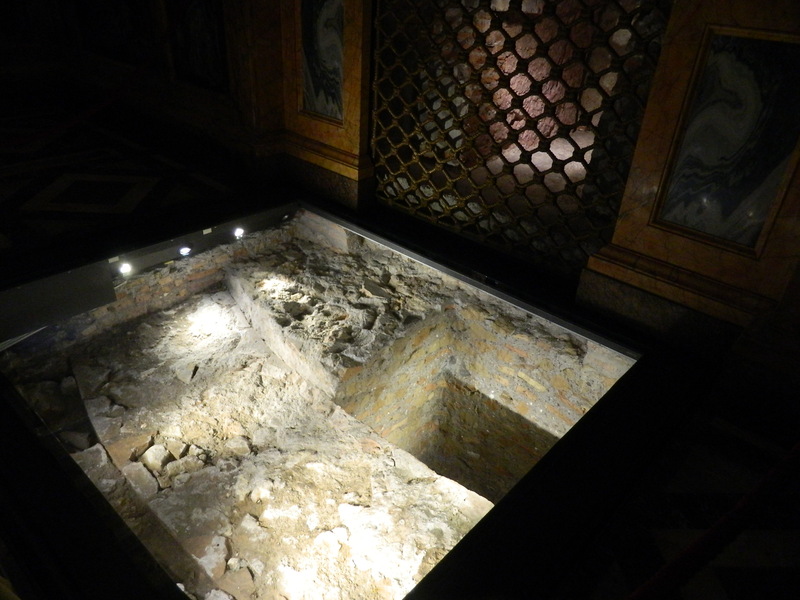 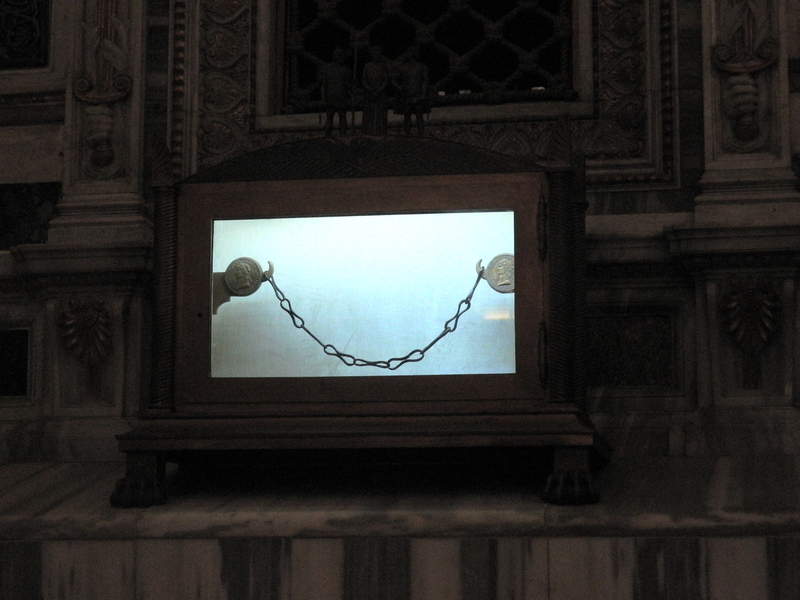 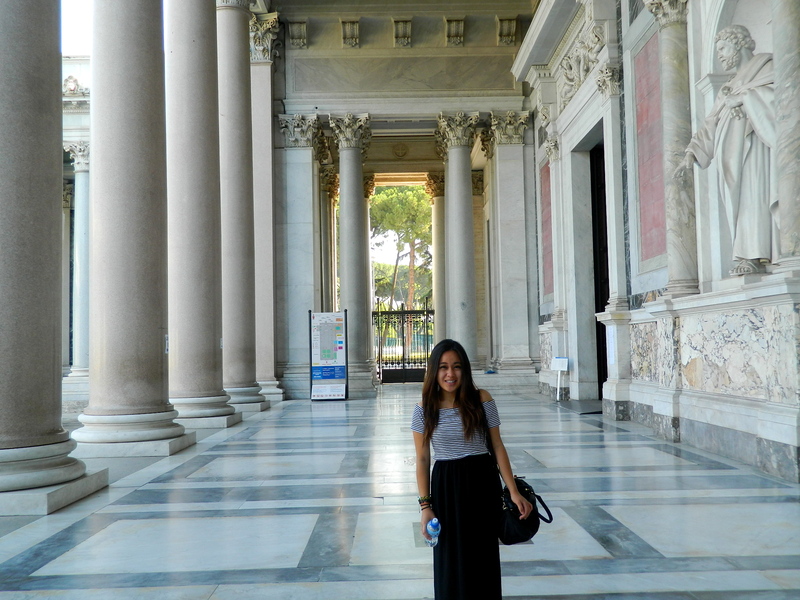 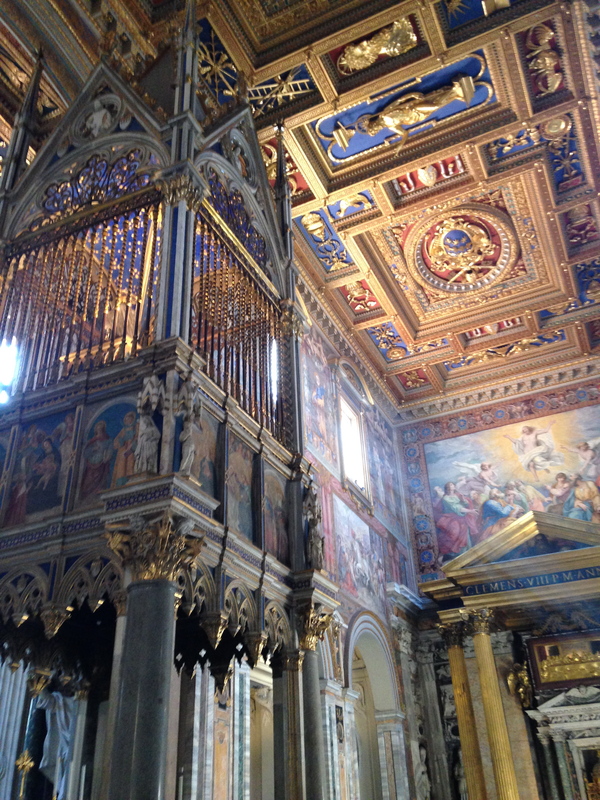 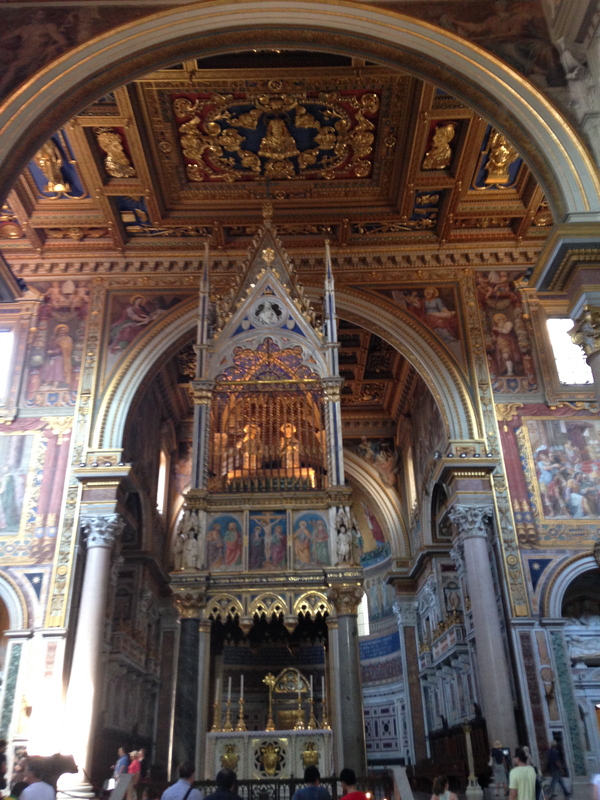 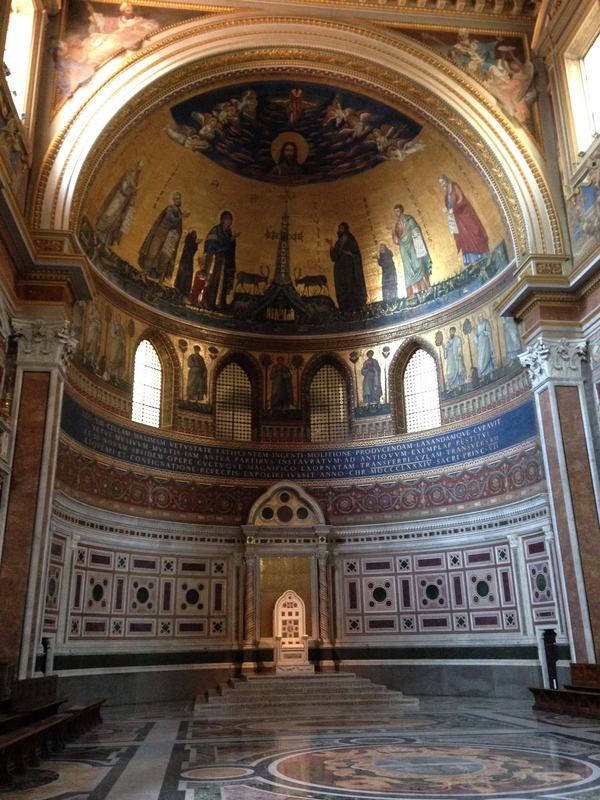 It was the very first church built in Rome, donated by Lateran family and built by emperor Constantine. 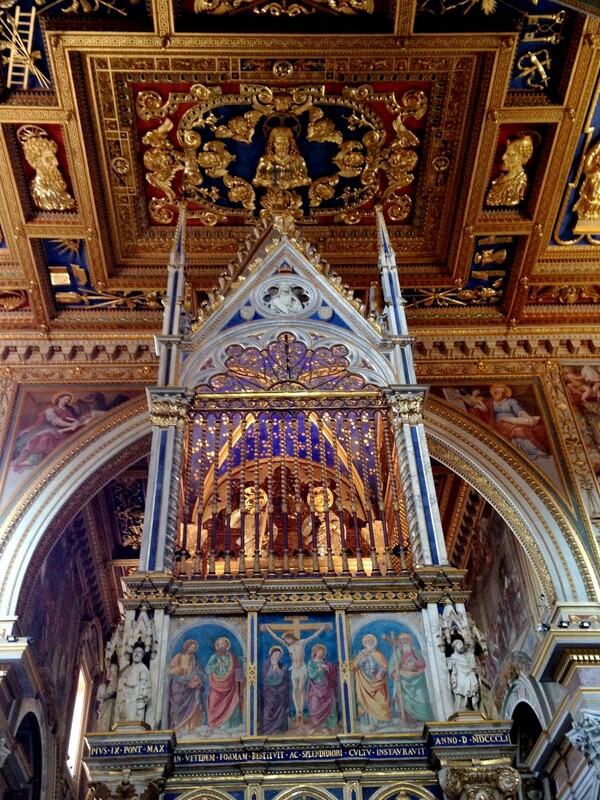 The Holy Altar, designed during the Gothic Middle Ages. 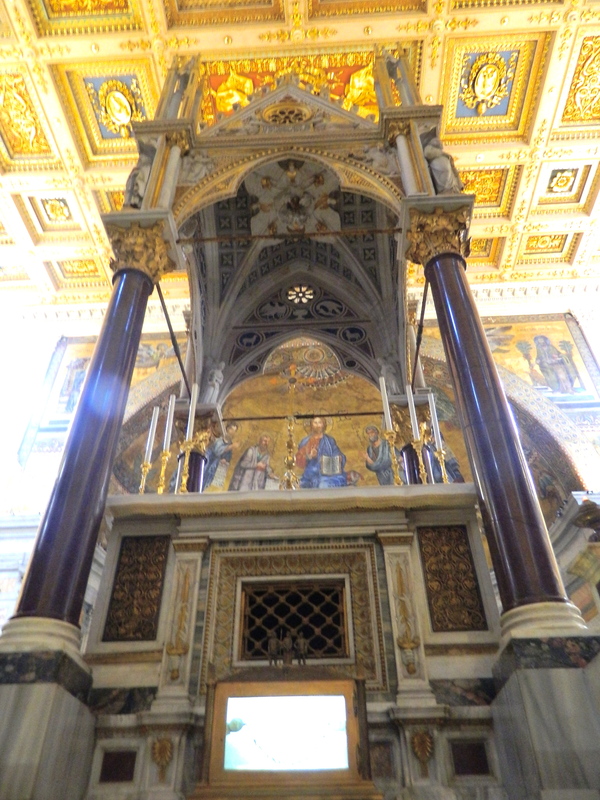 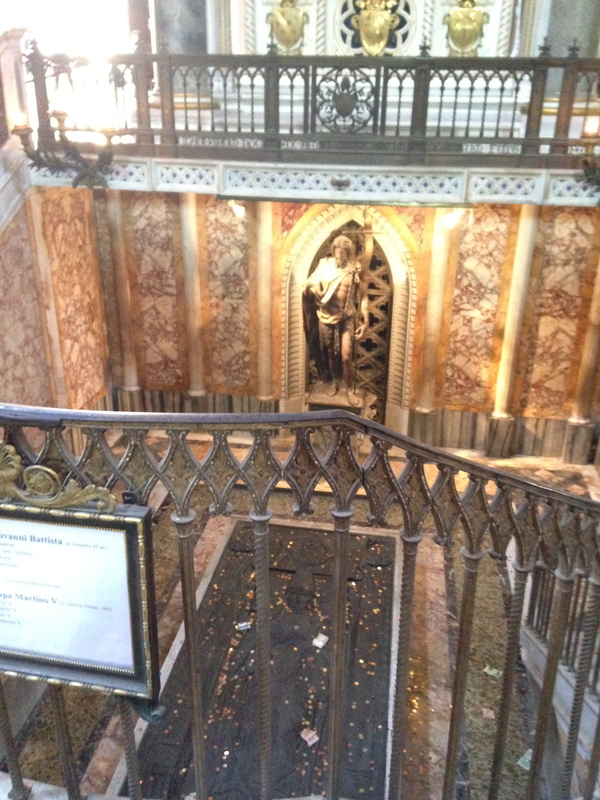 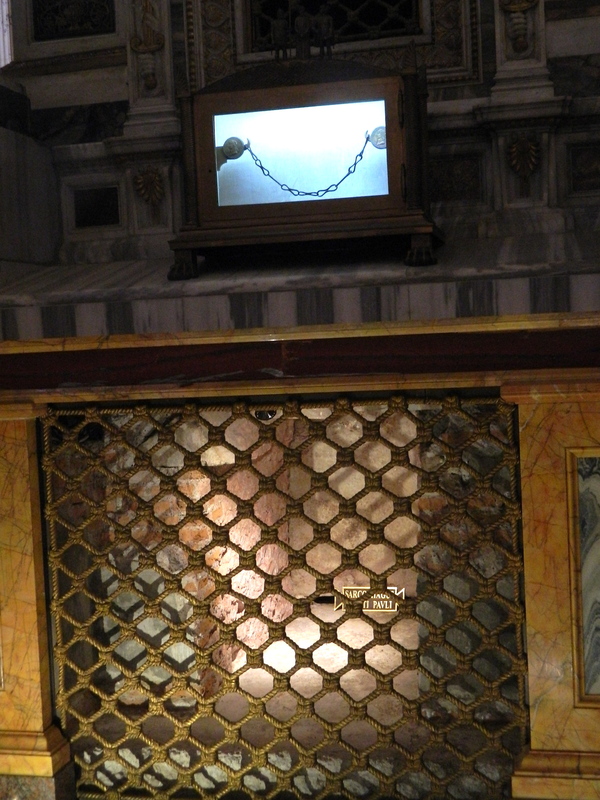 At the top, the lighted figures represent St. Peter and St. Paul, whose heads are also buried within the altar. 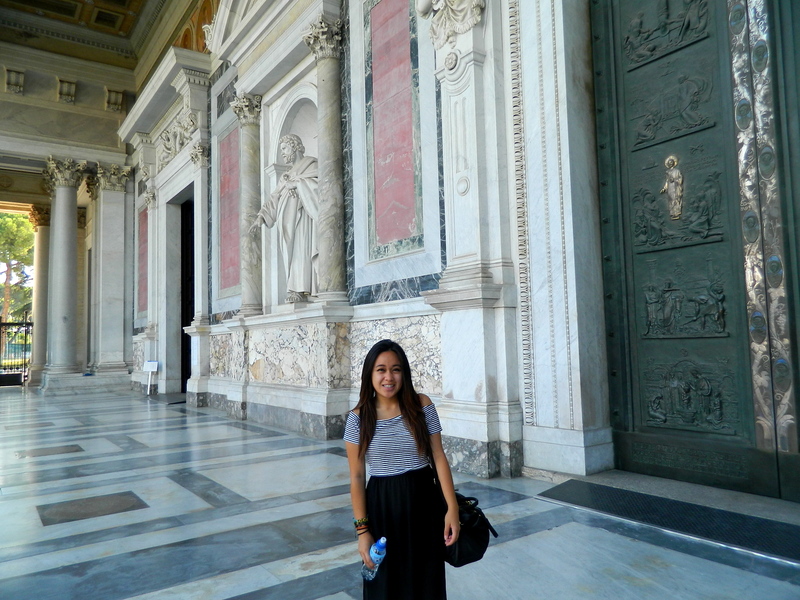 St. John Lateran is considered the official basilica/cathedral church of the diocese of Rome, and since the Pope is considered the bishop of Rome, this is his official ecclesiastical seat. 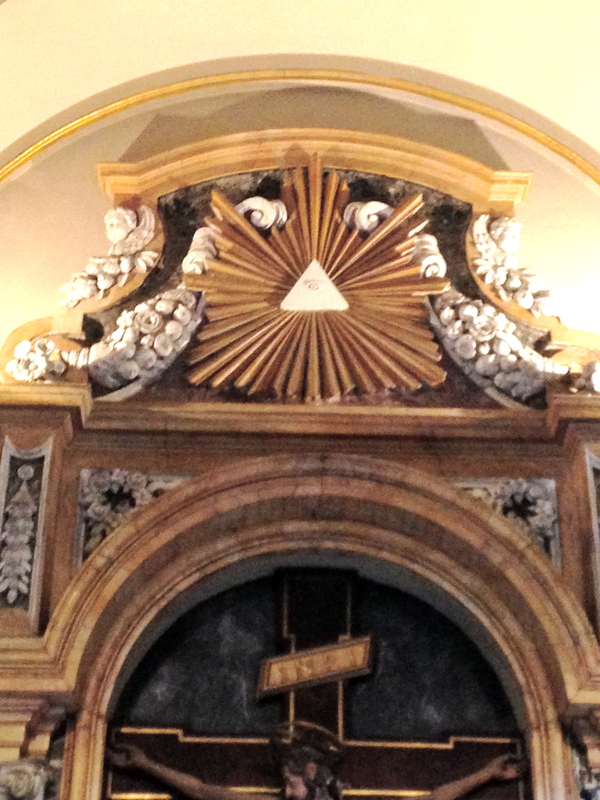 Got a little freaked out by the Illuminati insignia (the triangle with the eye) on top, but it actually represents the Holy Trinity, Father Son & Holy Spirit, watching over us! 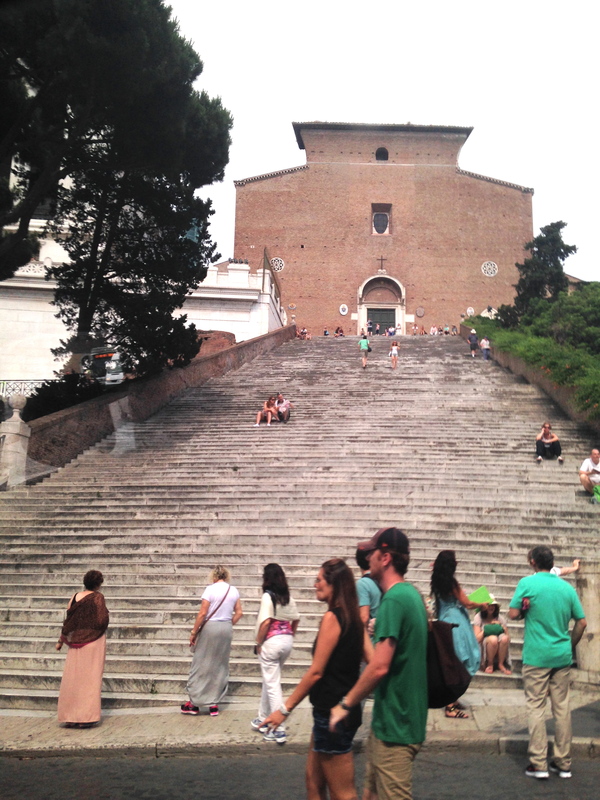 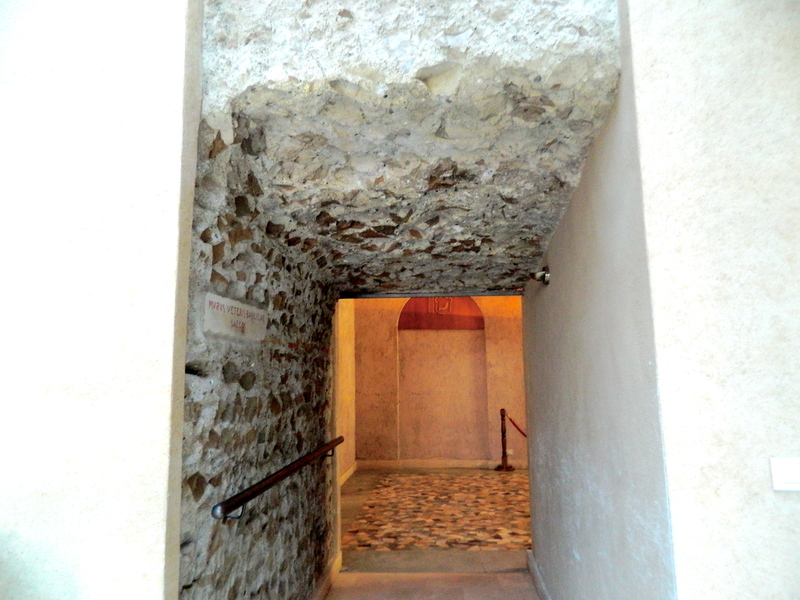 La Scala Santa; The Holy Stairs. 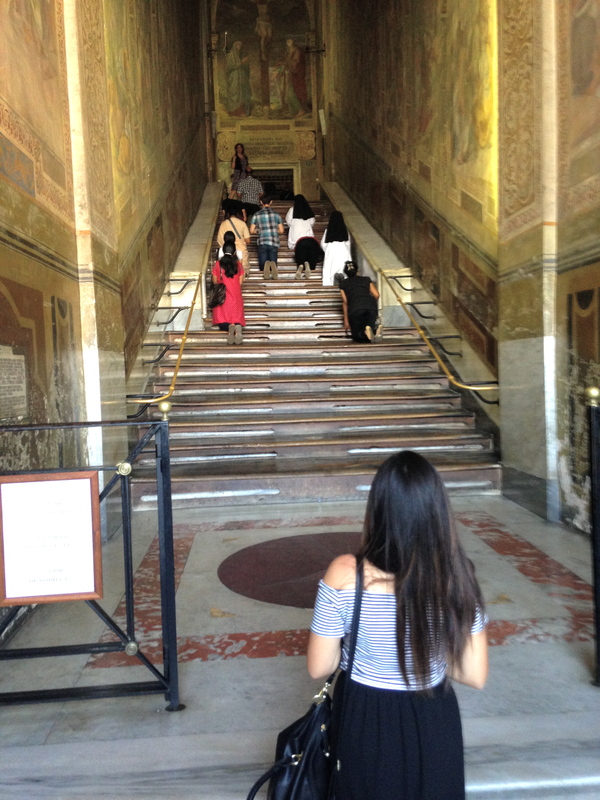 These are the set of stairs where Jesus Christ climbed to meet Pontius Pilate at his palace on the way to his Crucifixion. 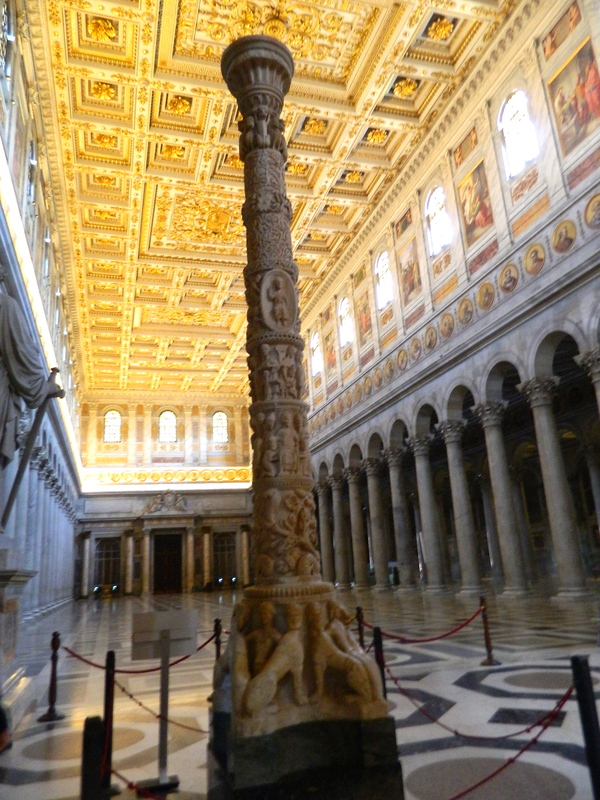 St. Helena, emperor Constantine’s mother, had the stairs shipped all the way from Jerusalem to this cathedral, and it is now a world-famous pilgrimage site of prayer and reverence. 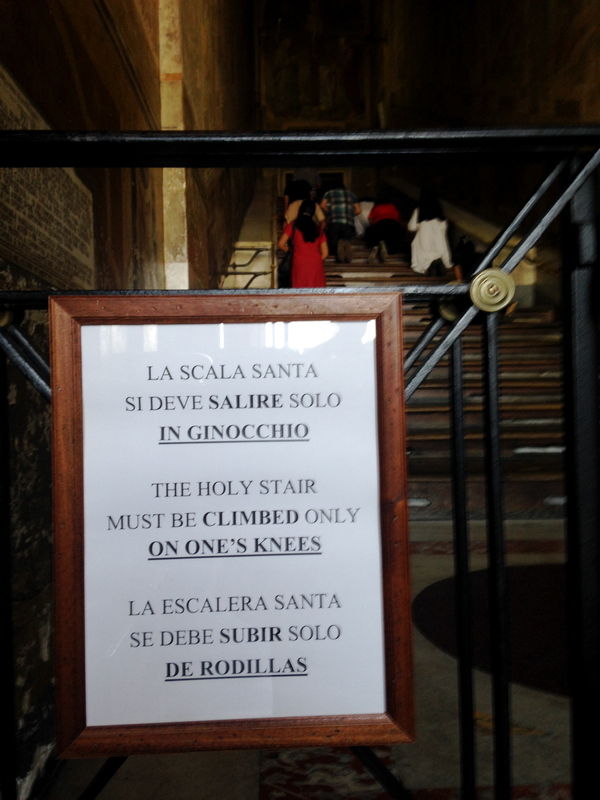 The stairs may only be climbed on your knees! 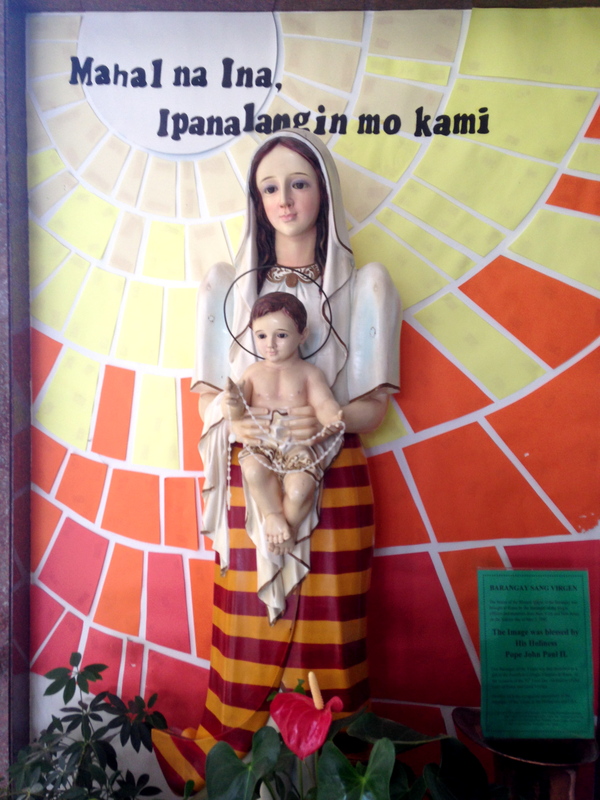 Sign of prayer and reverence. 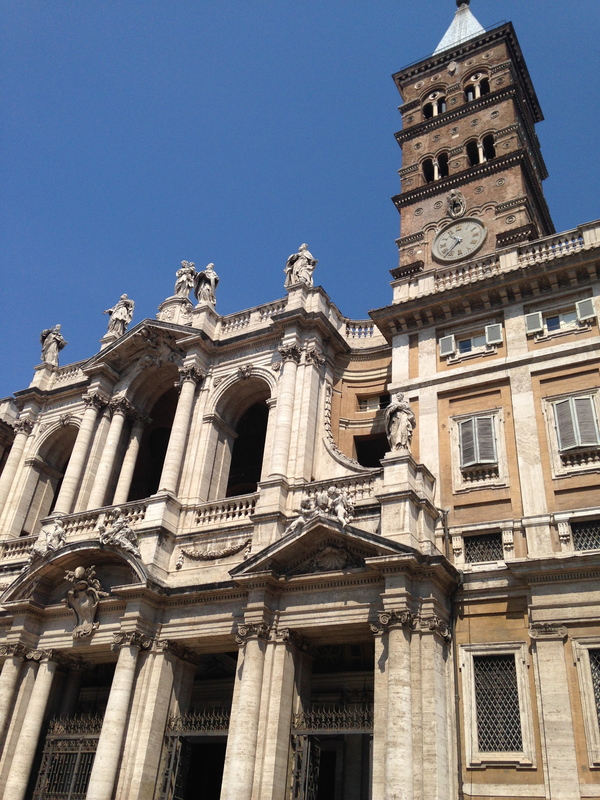 Exterior of the Basilica Papale di Santa Maria Maggiore (St. Maria Maggiore, or St. Mary Major). 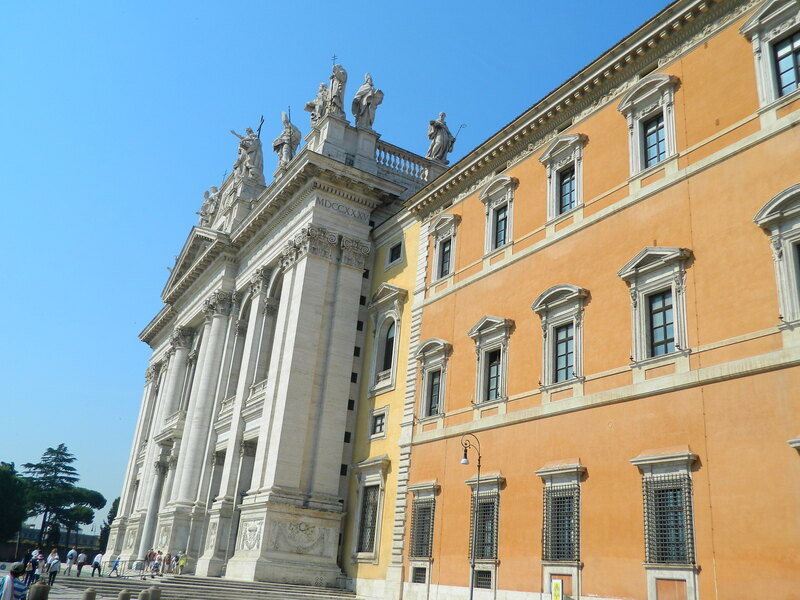 This is the largest Catholic Marian church in Rome, built by a Roman couple who were visited by a vision of the Virgin Mary. 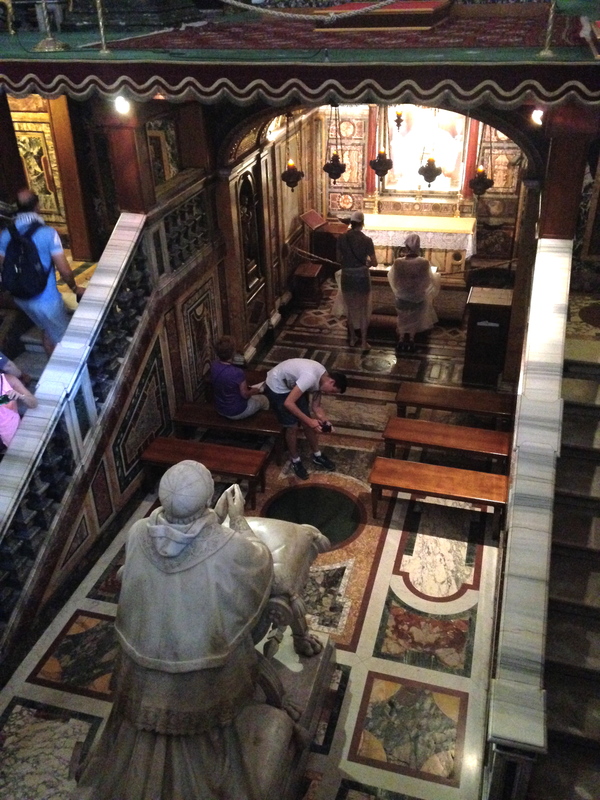 Under the high altar of the basilica is the crypt of the Nativity, or Bethlehem Crypt. 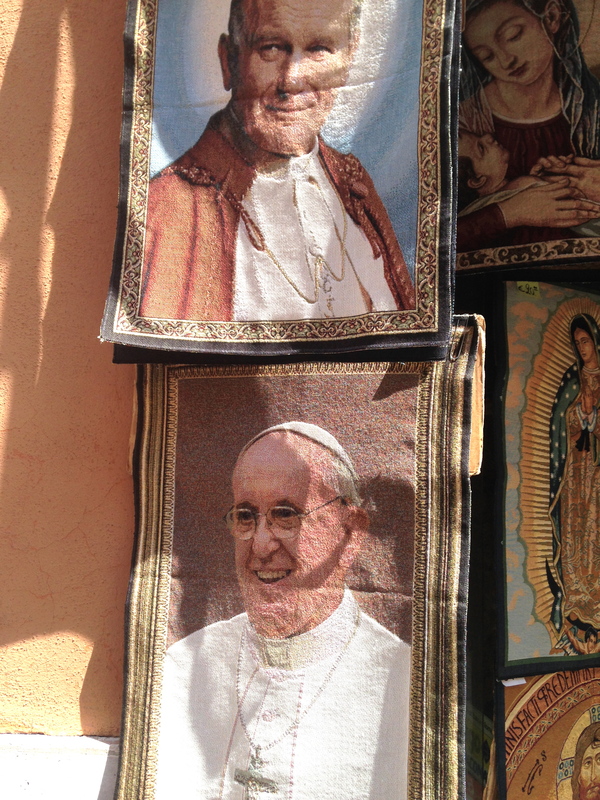 Outside, they were selling beautiful handmade tapestries of various saints and figures in the Church. 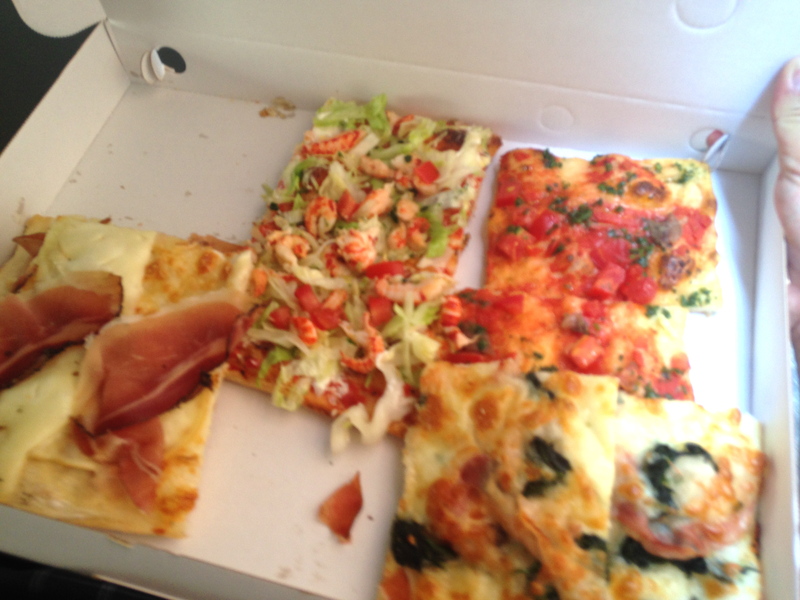 stopped for a quick bite to eat – pizza, of course. 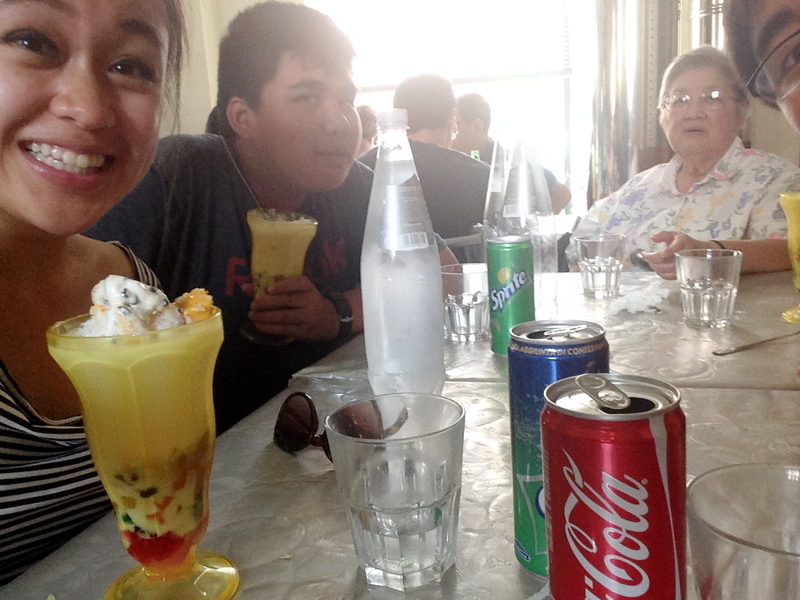 & later we got our first fix of Filipino food from Italy! 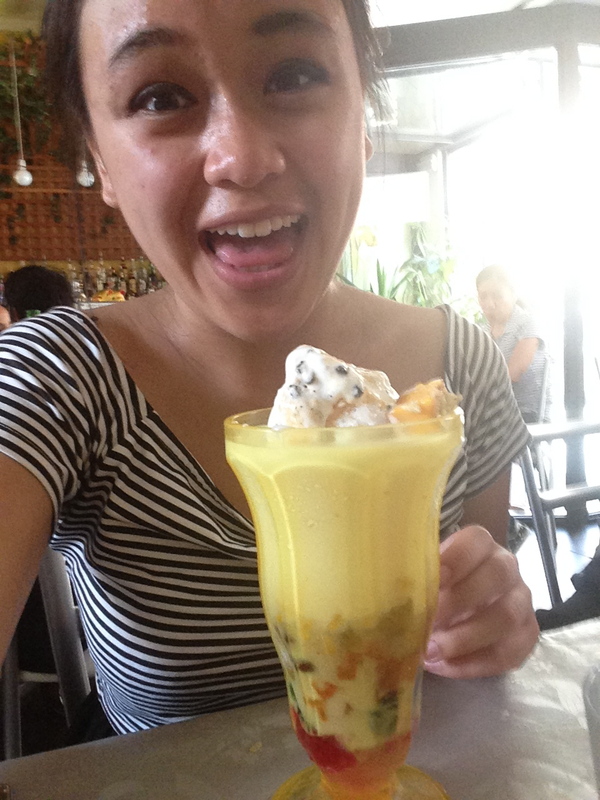 Here’s me looking excited over halo-halo. 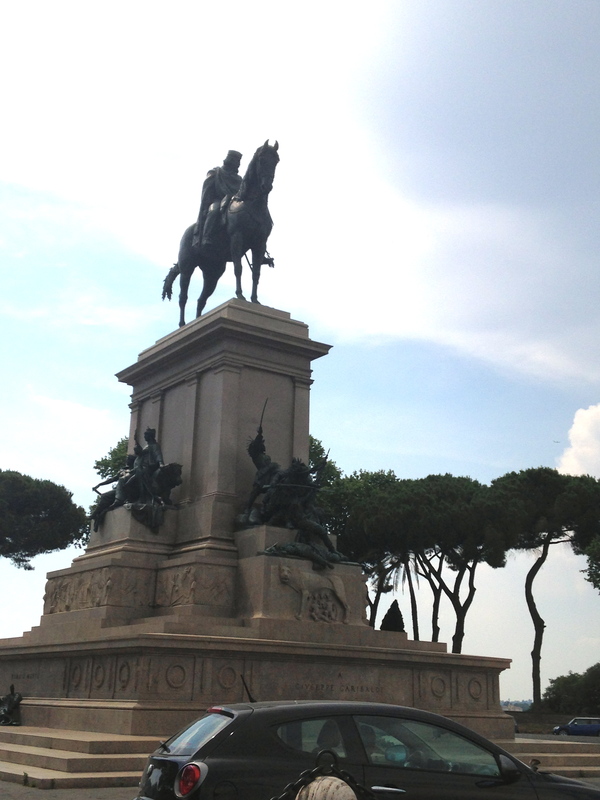 Stopped at a gorgeous lookout point at the top of Piazzale Giuseppe Garibaldi. 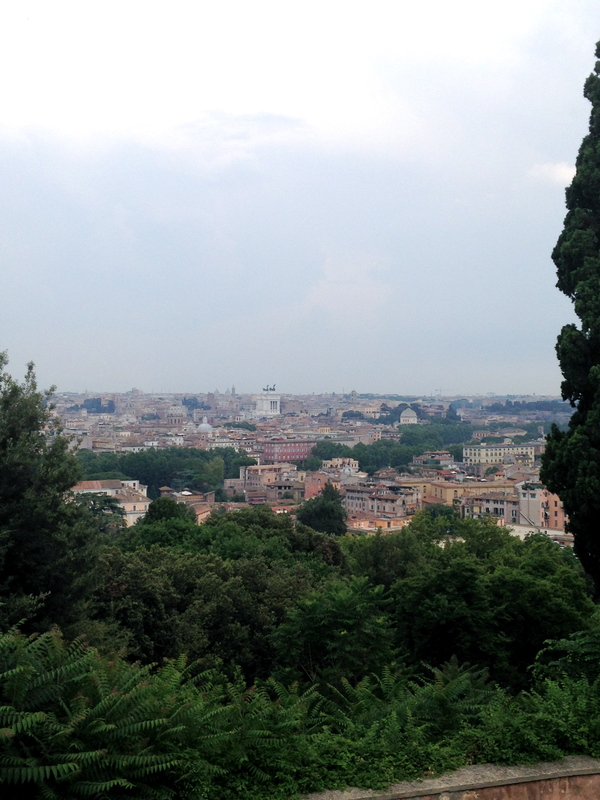 View of Rome! 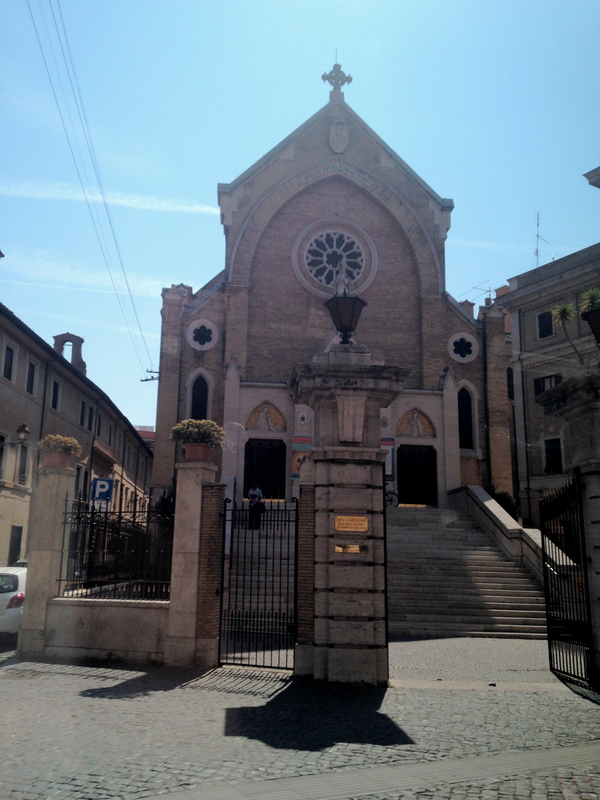 & finally, our last stop – the Chiesa del Gesu, the Church of Jesus. 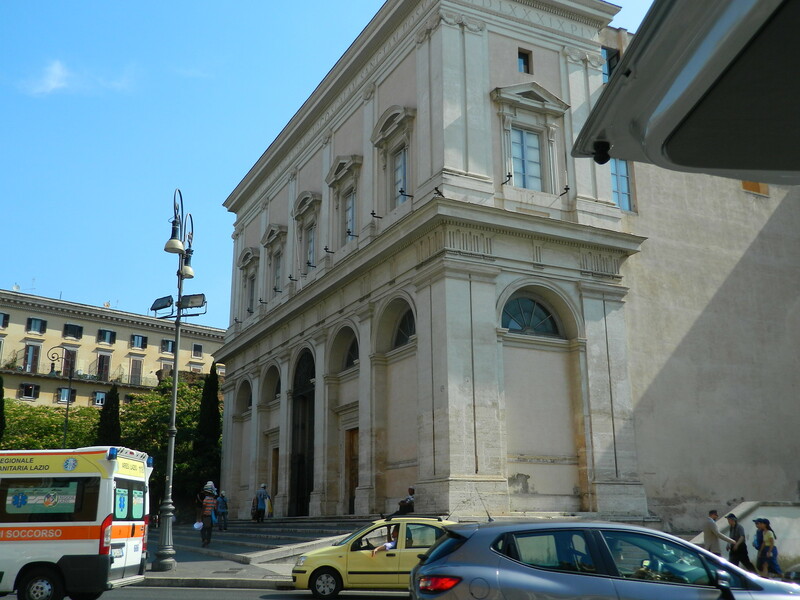 While this is not one of the main major basilicas, stopping at this church was a special visit, because it is the headquarters/mother church of the Society of Jesus, the Jesuits. 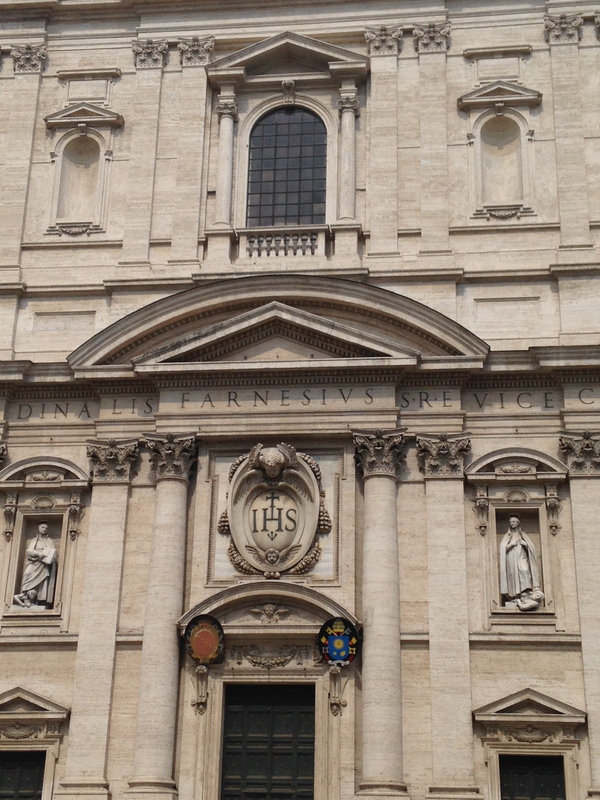 The IHS insignia which the Jesuits, founded by St. Ignatius of Loyola, are known for. 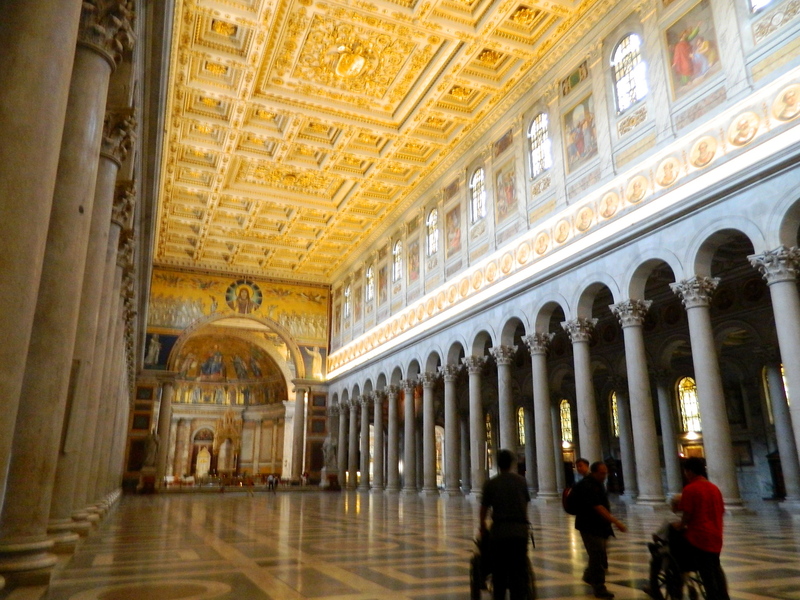 Beautiful interior. 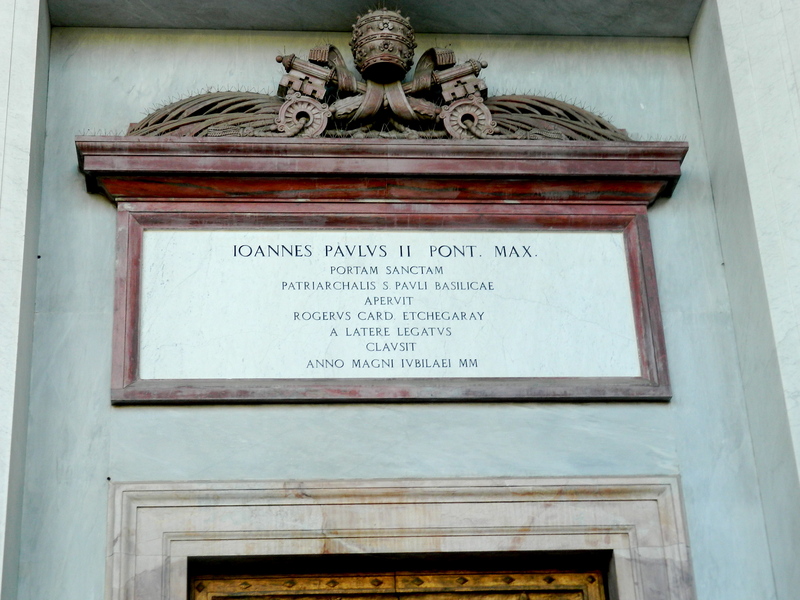 The main architects involved in construction were Giacomo Barozzi da Vignola and Giacomo della Porta. 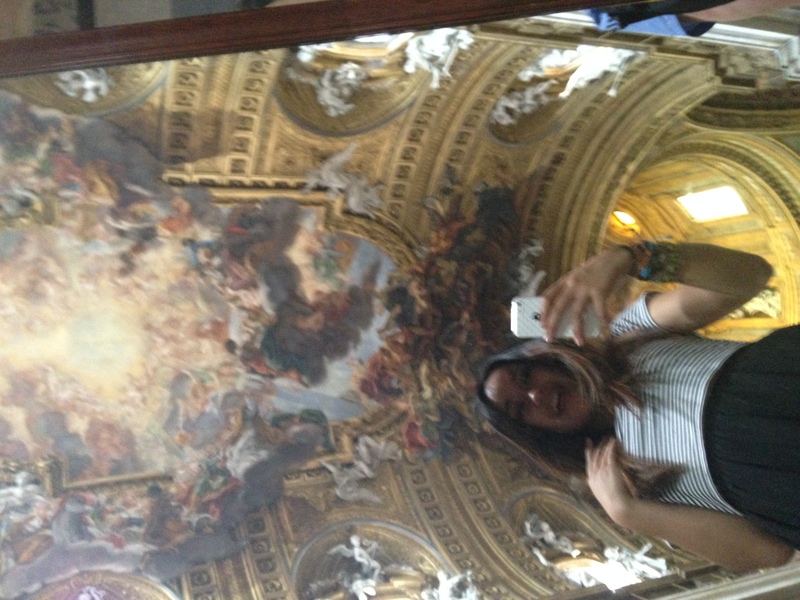 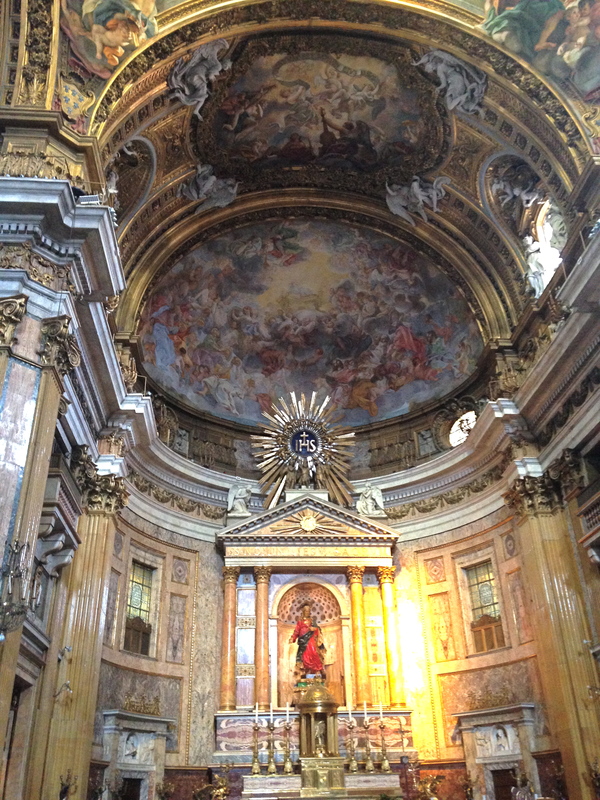 In the center of a chiesa is a long mirror, allowing visitors to look up to the religious art-adorned ceiling. 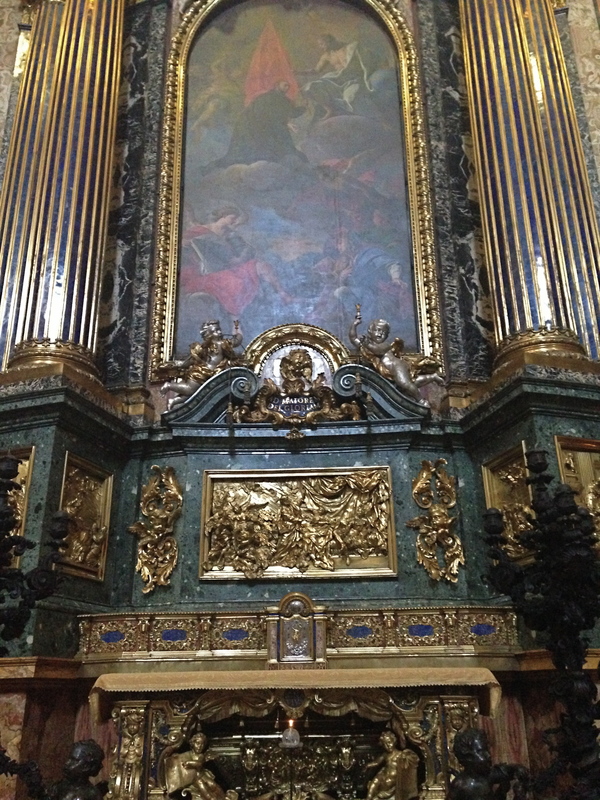 The Altar/Tomb of St. Ignatius of Loyola, designed by Andrea Pozzo in the 17th century. 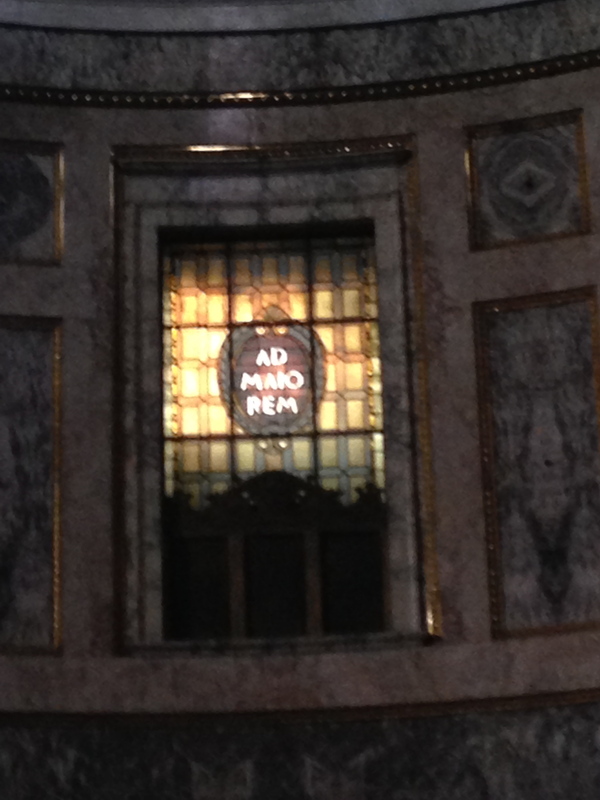 Ad majorem dei gloriam – for the greater glory of God! 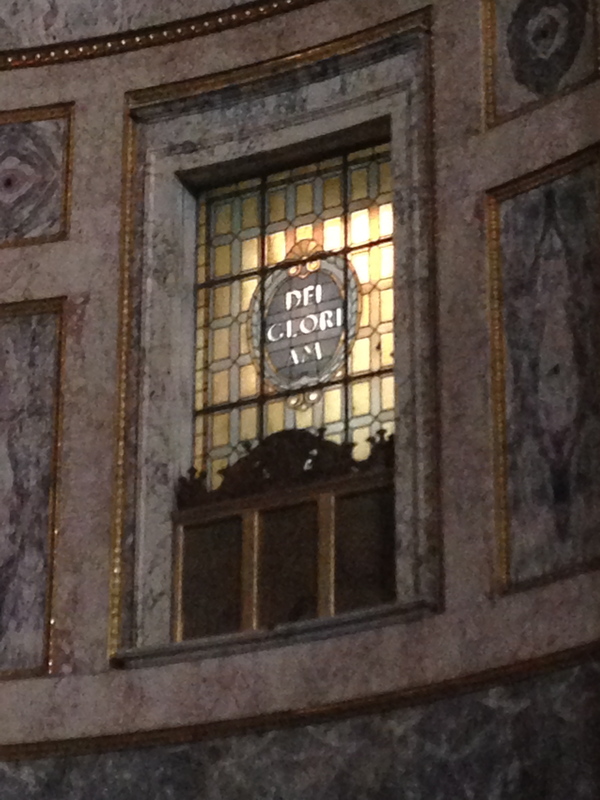 The motto of the Jesuits. 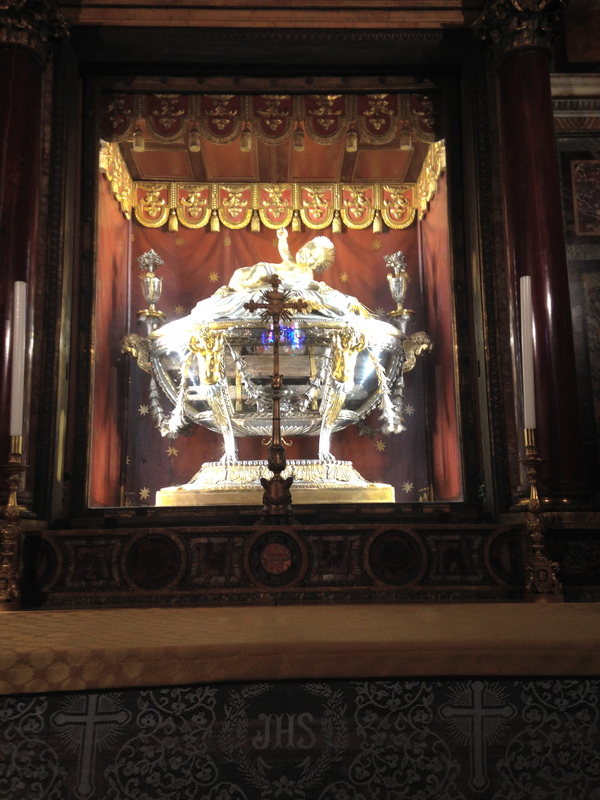 The bronze urn in the center holds the body of St. Ignatius. 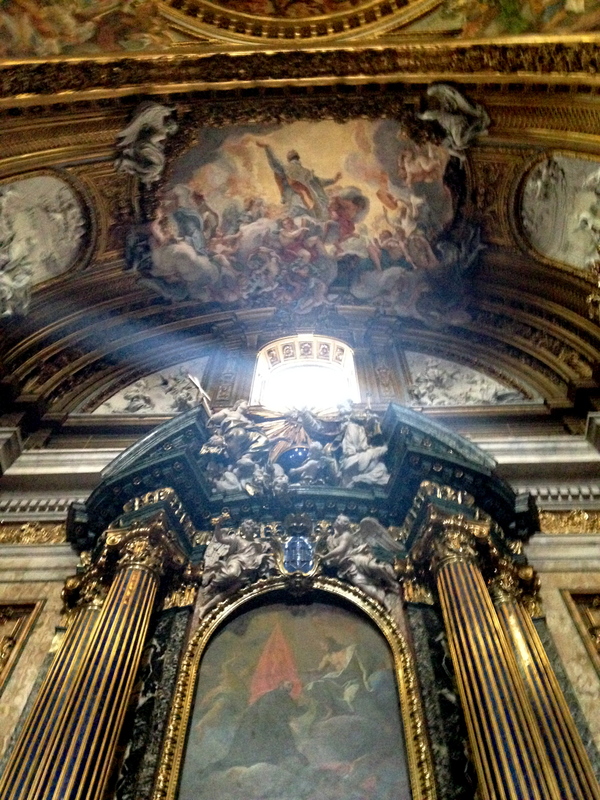 Beautiful artwork depicting Ignatius being called up into heaven to join Christ and the angels. 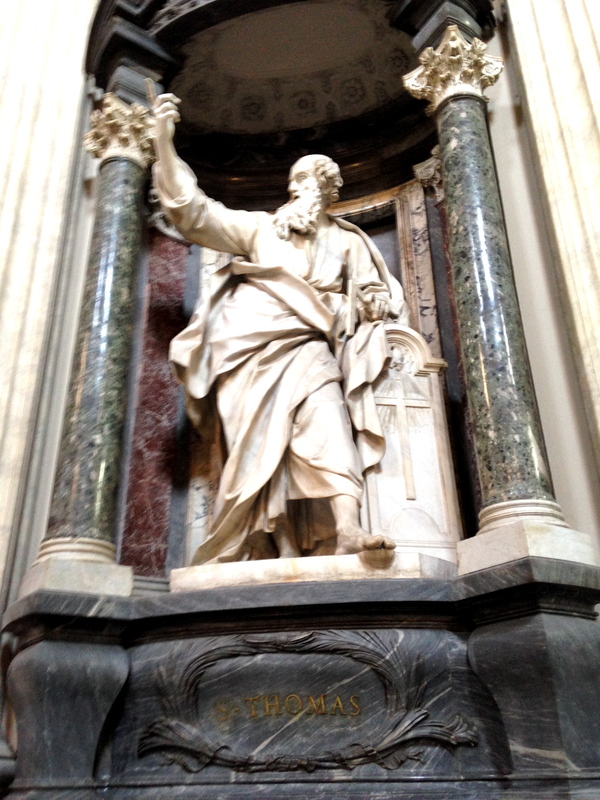 Selfie with St. Ignatius! 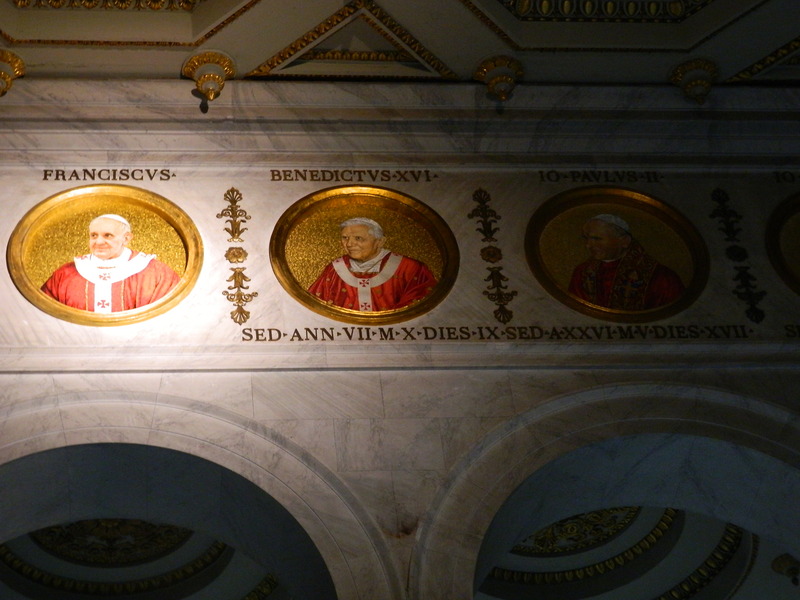 (because I love the Jesuits). 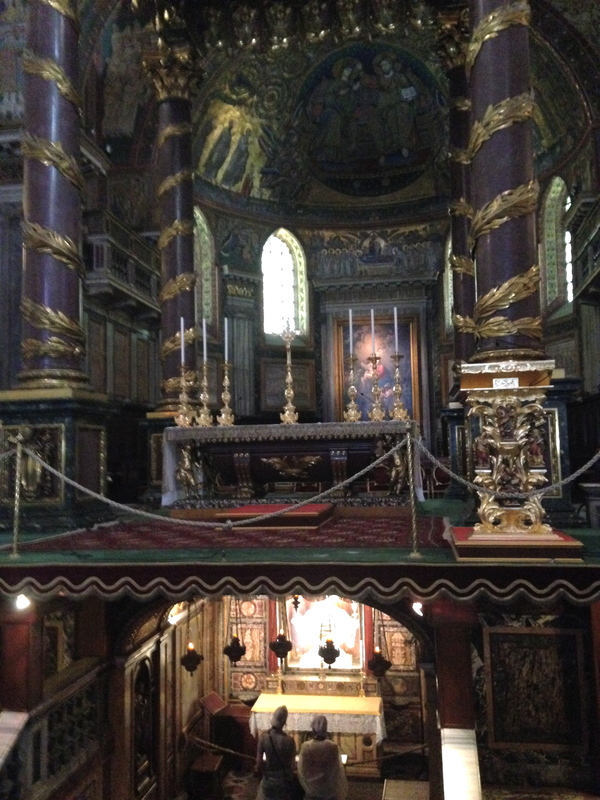 Walking into the Chiesa del Gesu, the final resting place of St. Ignatius, I was overcome with great peace and comfort, like I was walking into a house I’ve always known. 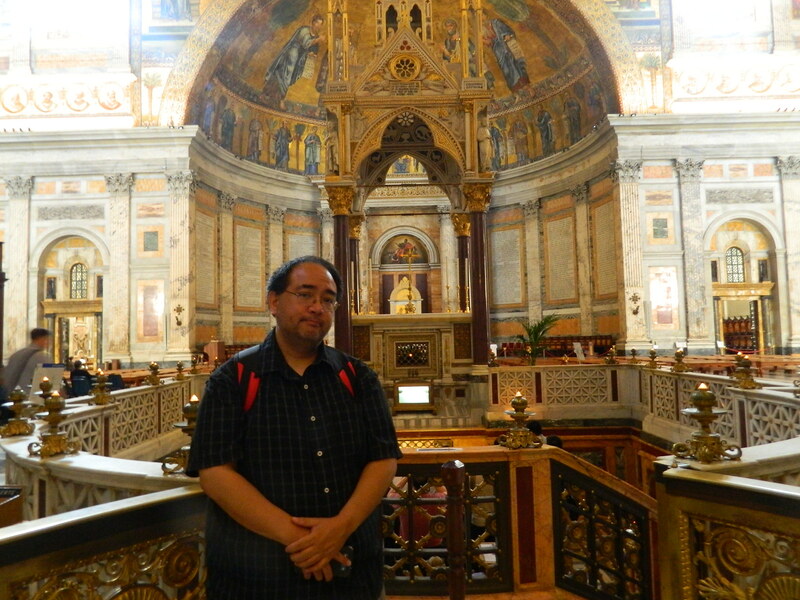 It was a different feeling from the one I had in the four great basilicas – it was like I was back at my college, Loyola Marymount, entering the Sacred Heart Chapel where I’d spent so many years. 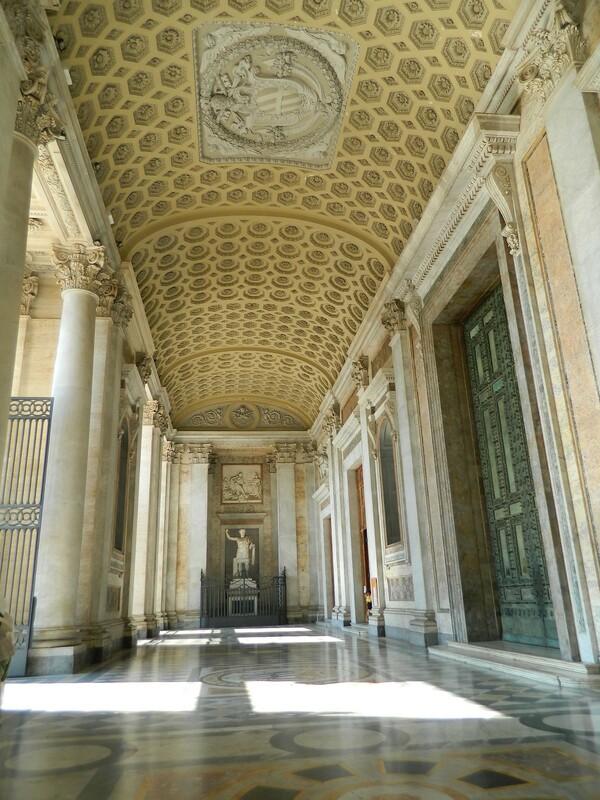 Even though the architecture, language, and setting was totally different, it was the same sense of comfort and love that is so common for the Jesuits. 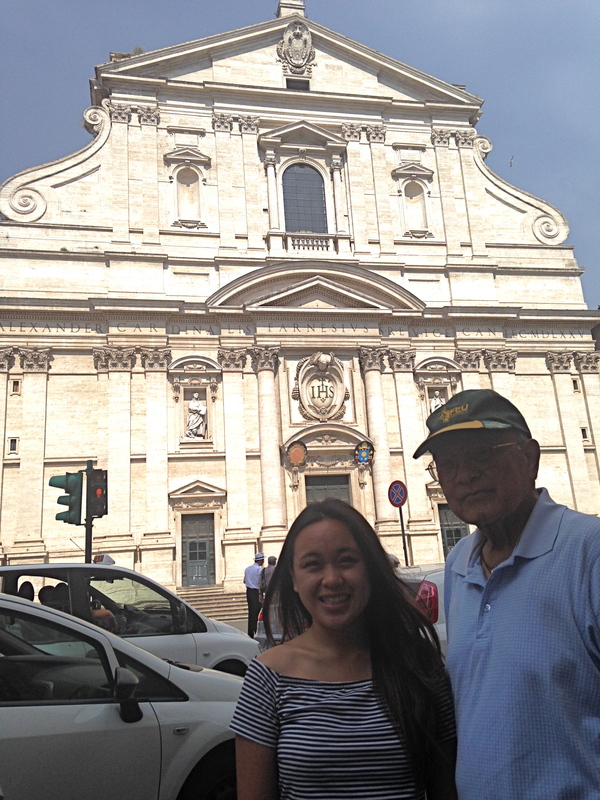 I was really excited and humbled just to be there, as well as my Lolo Pete, who also went to a Jesuit university back in the Philippines. 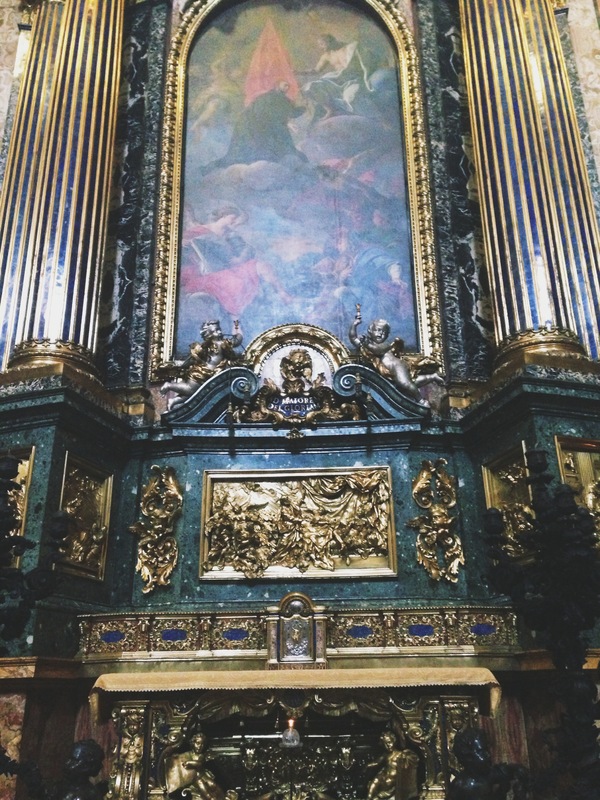 I kept thinking of all the songs I heard during mass back at school and singing them in my head. 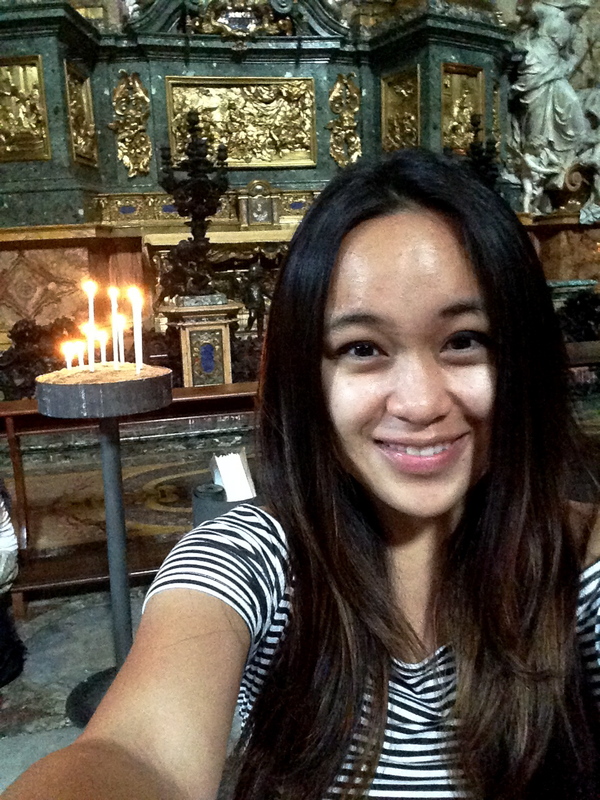 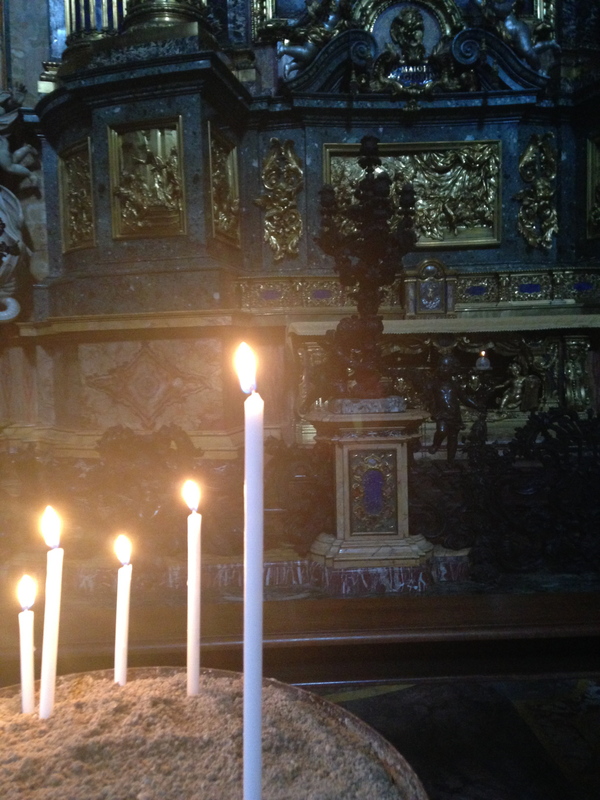 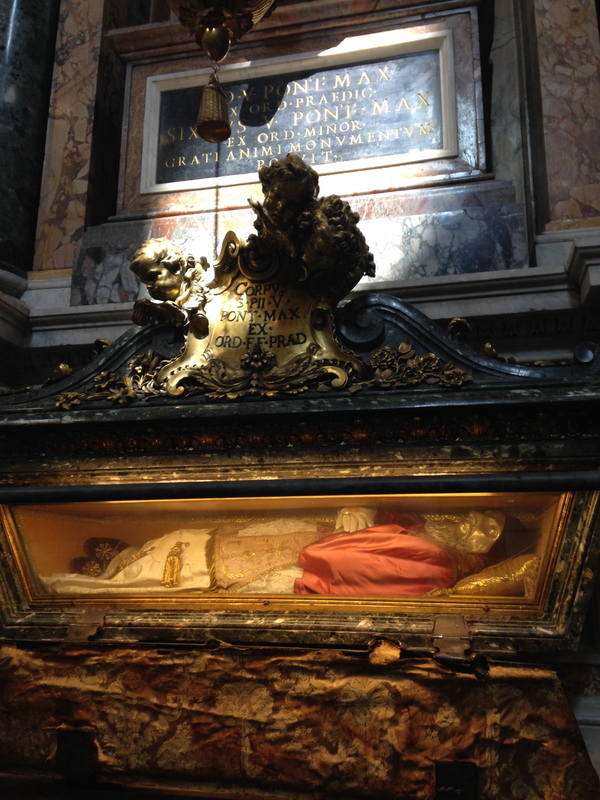 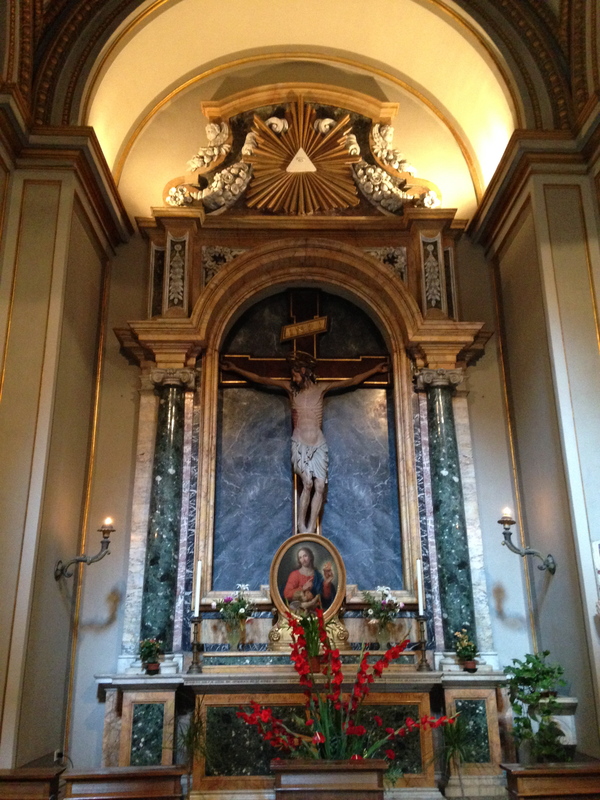 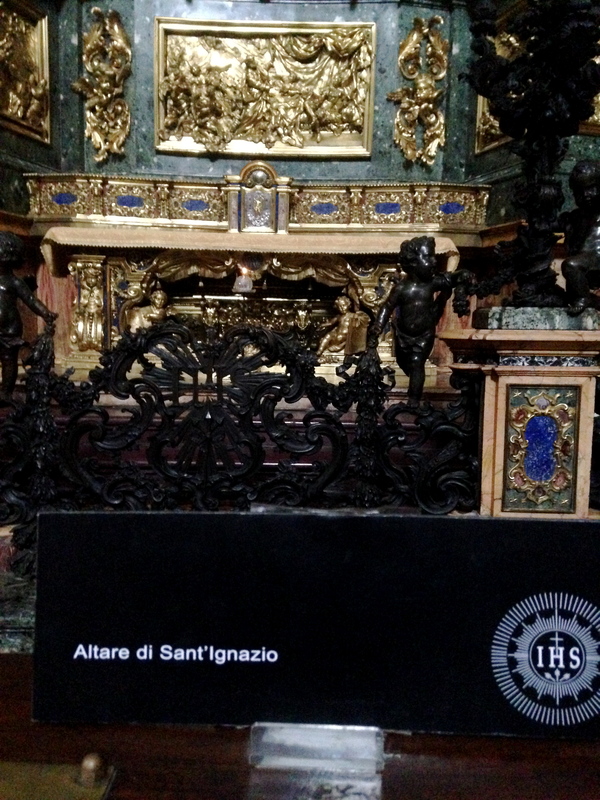 Seeing the tomb and altar of St. Ignatius, who is by far one of my favorite saints, I felt so much peace and joy. 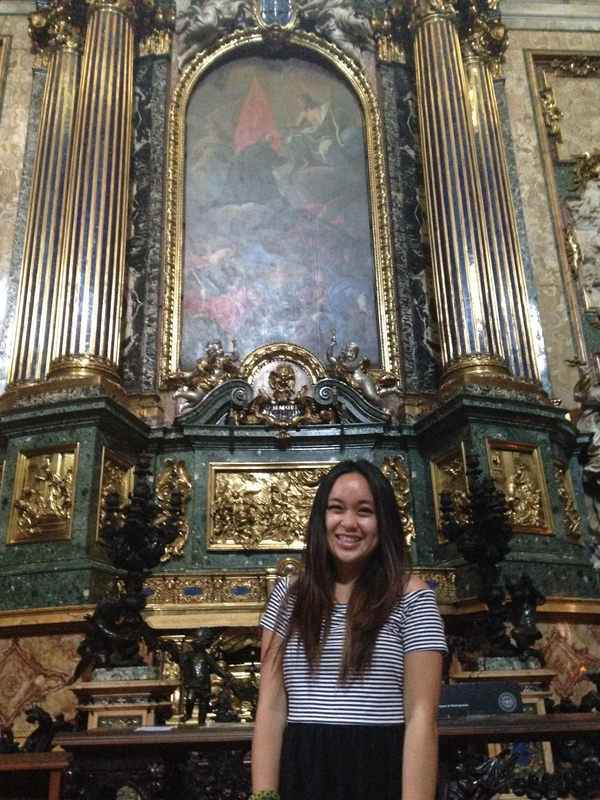 After four years at a Jesuit university, it was only fitting to end my college career by giving thanks to the saint who made it all happen. 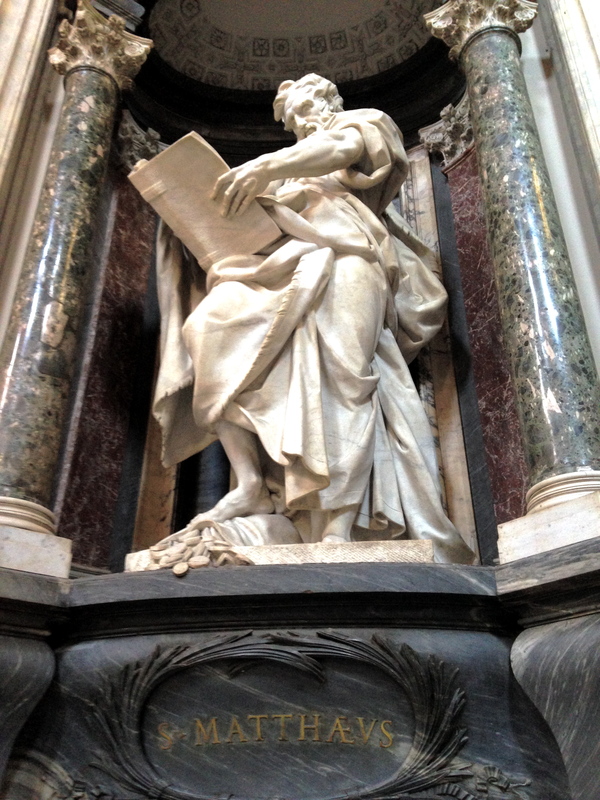 St. Ignatius has inspired me with his devotion and humility, his Spiritual Exercises, his motto “ad majorem dei gloriam!,” and his words/actions of great love. 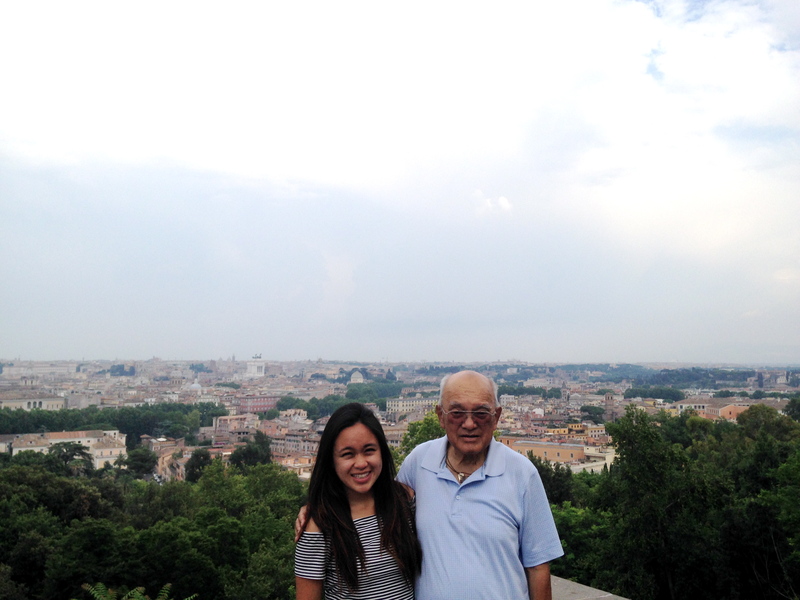 As a person and saint he has taught me so many things, especially while at this school having a “Jesuit-infused” education of the whole person. 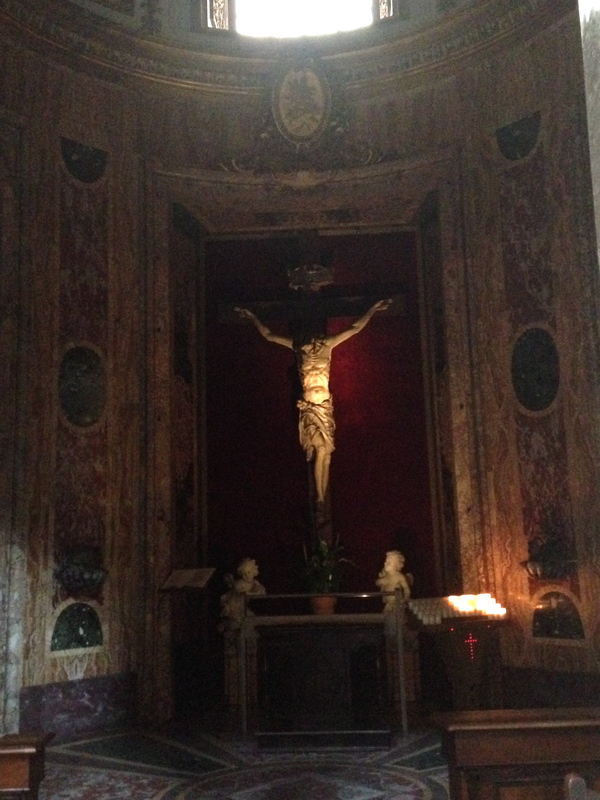 I was so thankful to have been in his presence and to pray at his tomb. 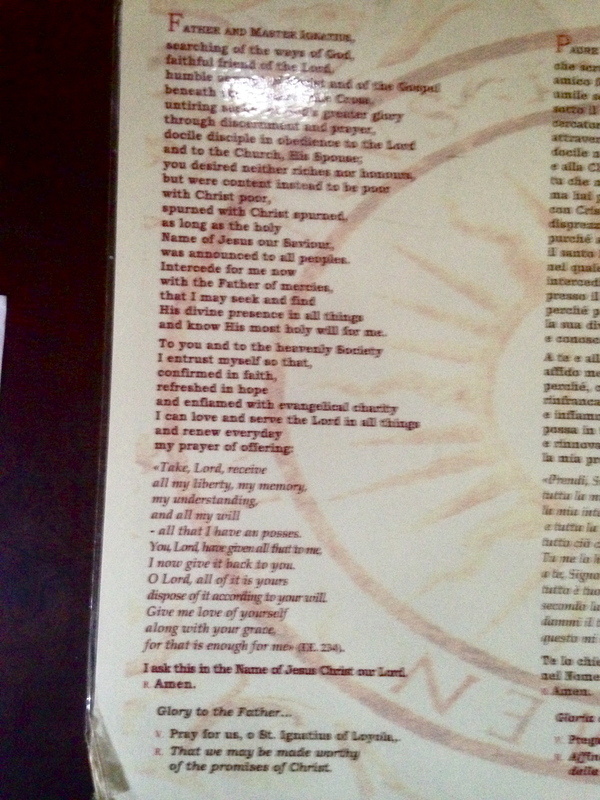 Thank you, St. Ignatius of Loyola, for always watching over & interceding for me, my family and my friends! 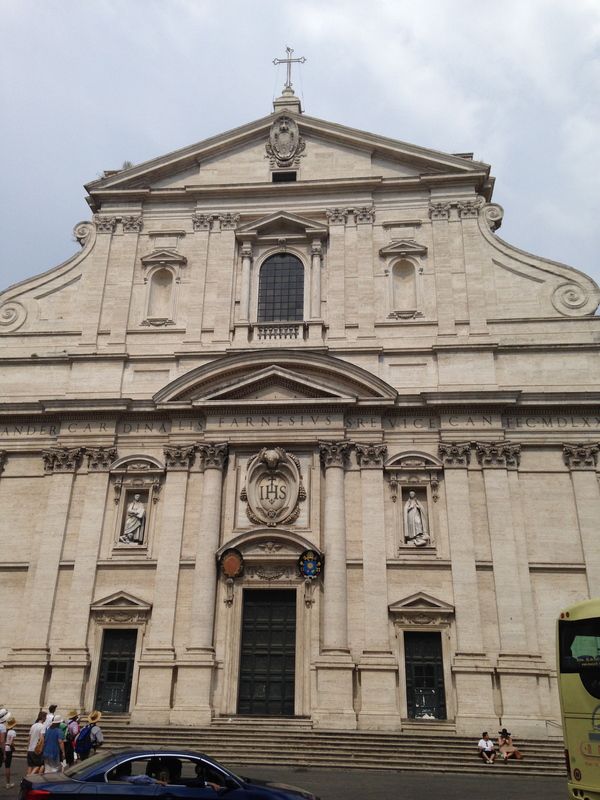 Visiting the major basilicas and the Chiesa del Gesu all in one day was a beautiful, humbling moment of great prayer and reverence. 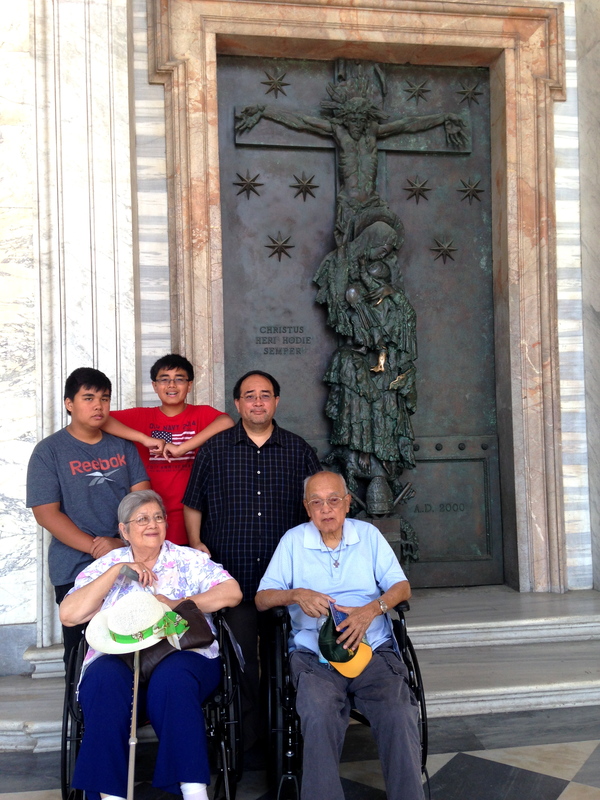 I am really glad that my family and I were able to experience it and complete our religious pilgrimage. 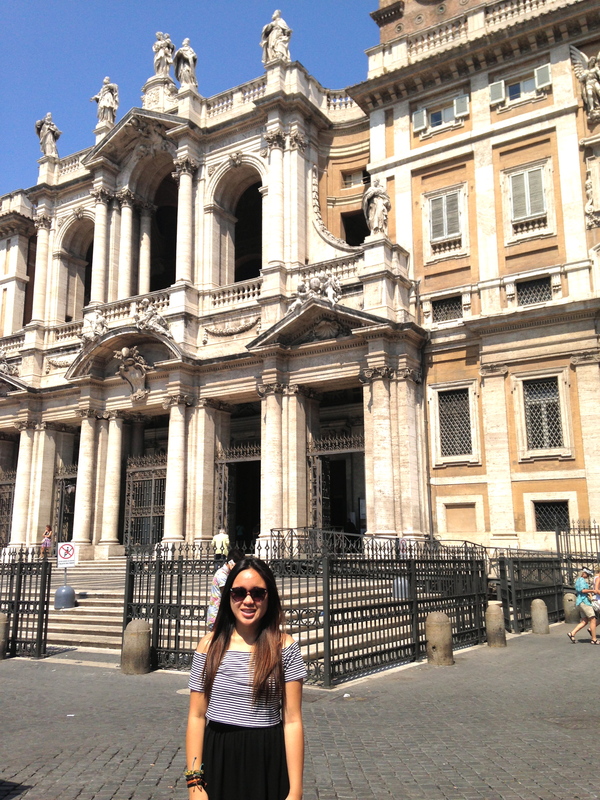 Now it’s time for all of the cultural, adventure-y, exploring the city stuff! 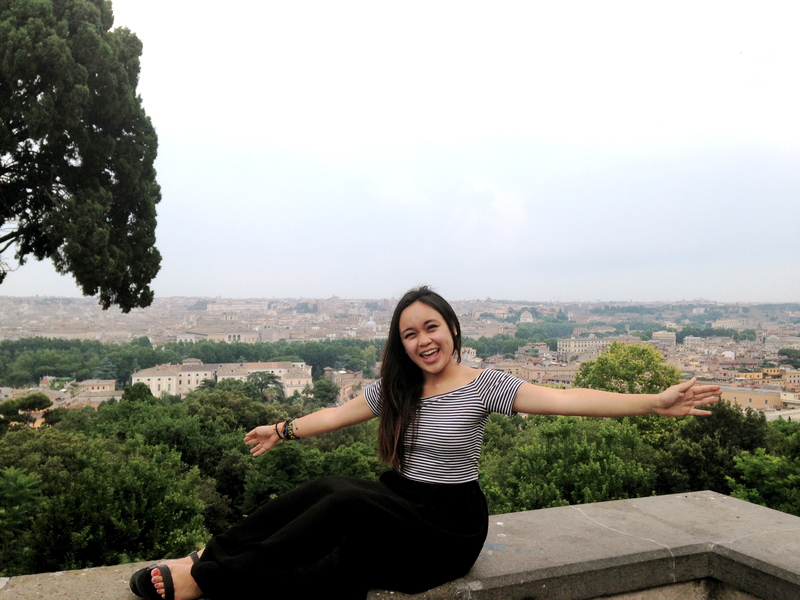 Roma, it’s so good to see you again. 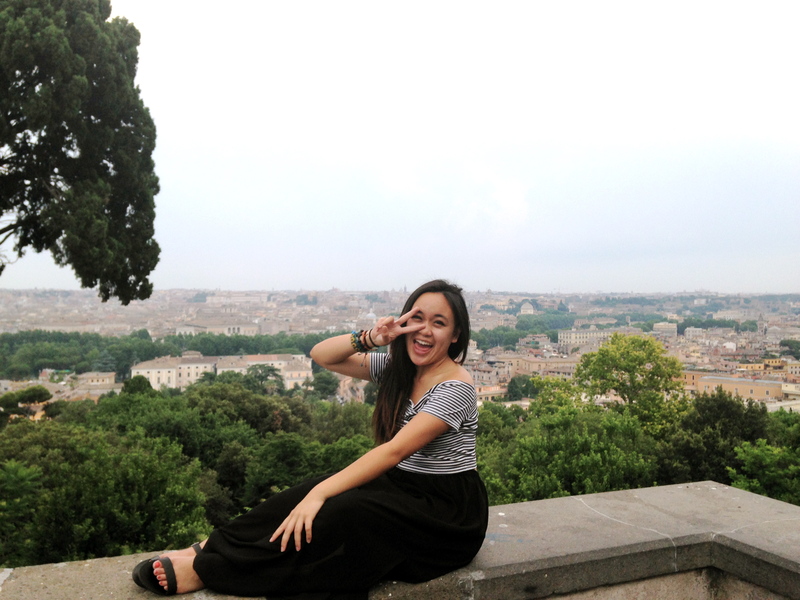 Hi Allyson! 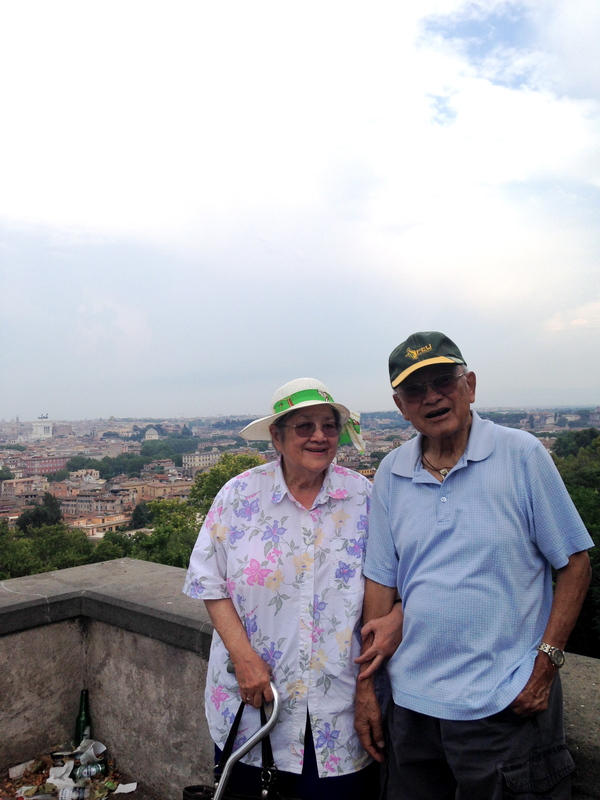 First & foremost, thank you so much for sharing with us your amazing adventures. 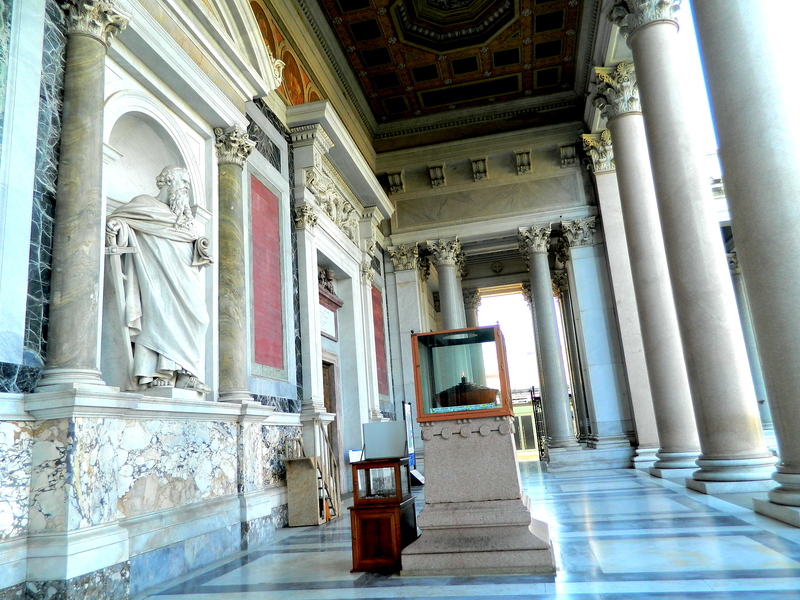 I’ve enjoyed reading your blog, seeing you visit beautiful and historical churches and basilicas only I can imagine visiting and most of all, your taking notes of the history behind it. 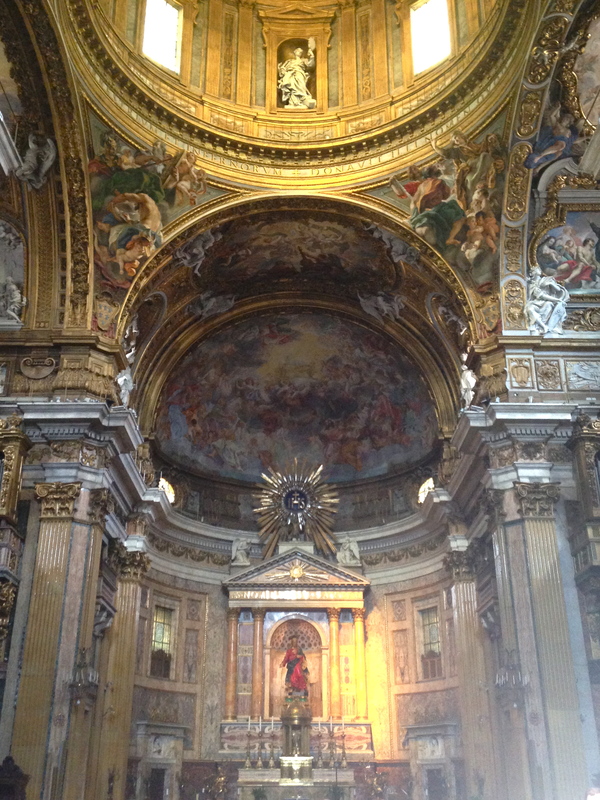 The pictures were amazing!! 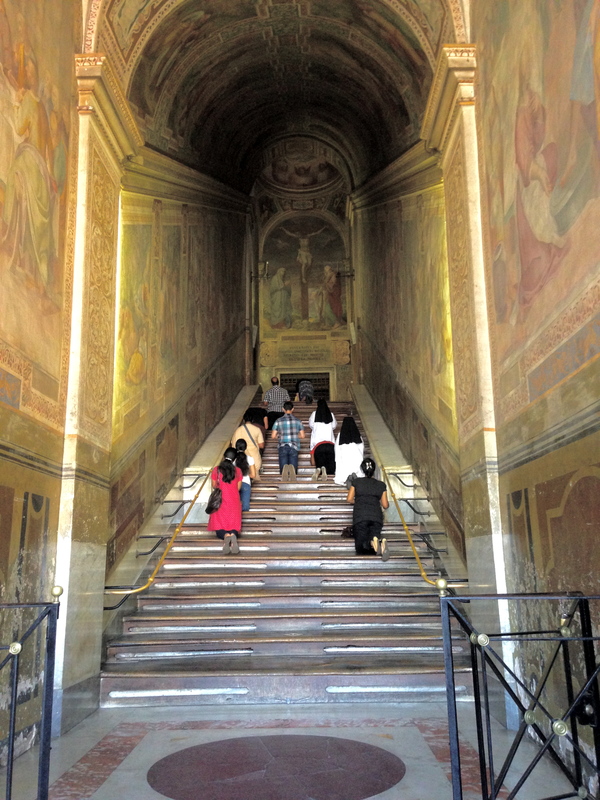 If I had to choose a favorite, it would be the Holy Stairs, the Duomo, Padre Pio, St Francis, St Ignatius, Pope Francis, the relics, the Colosseum, etc. 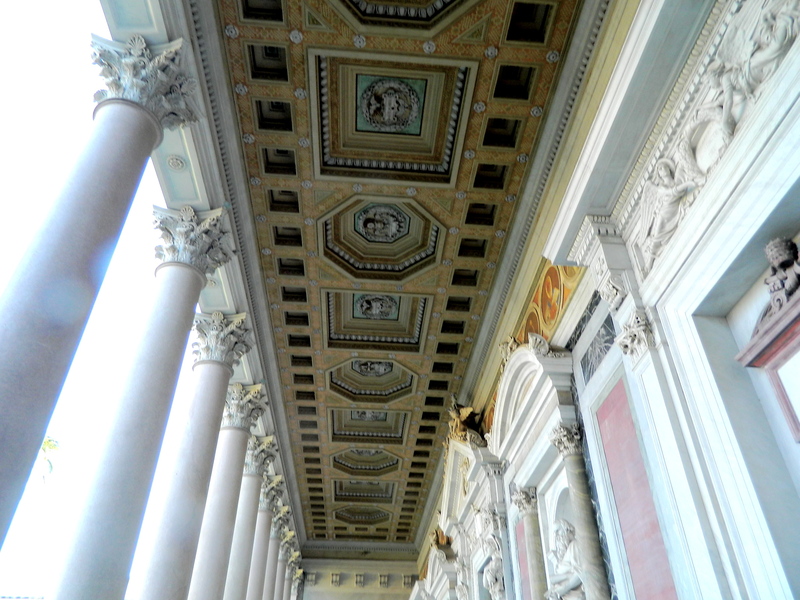 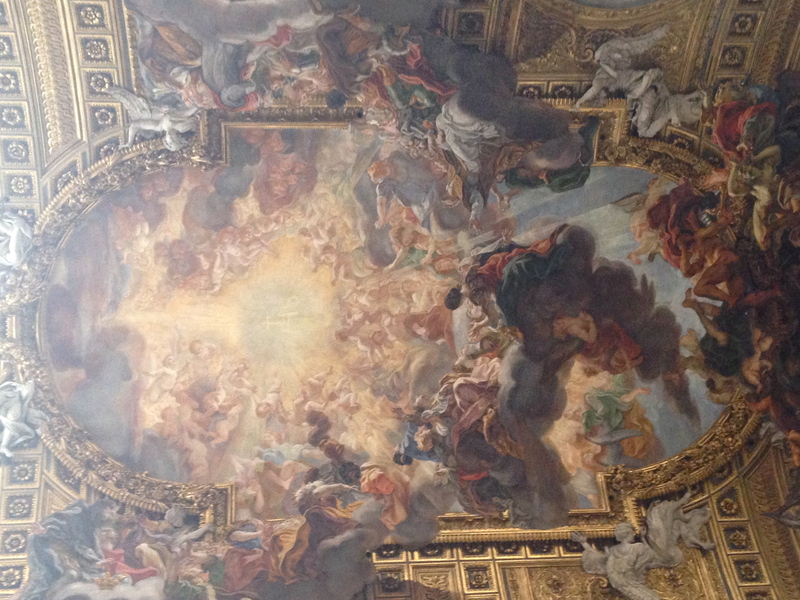 I was completely immersed and captivated in all of its Renaissance beauty and splendor.